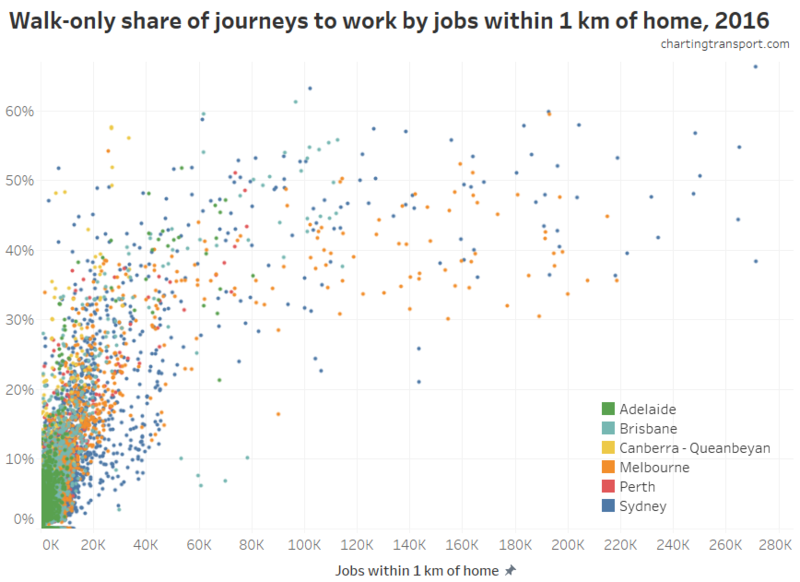 The Australian census provides incredibly rich data about journeys to work, with every journey classified by origin, destination, and mode(s) of transport. 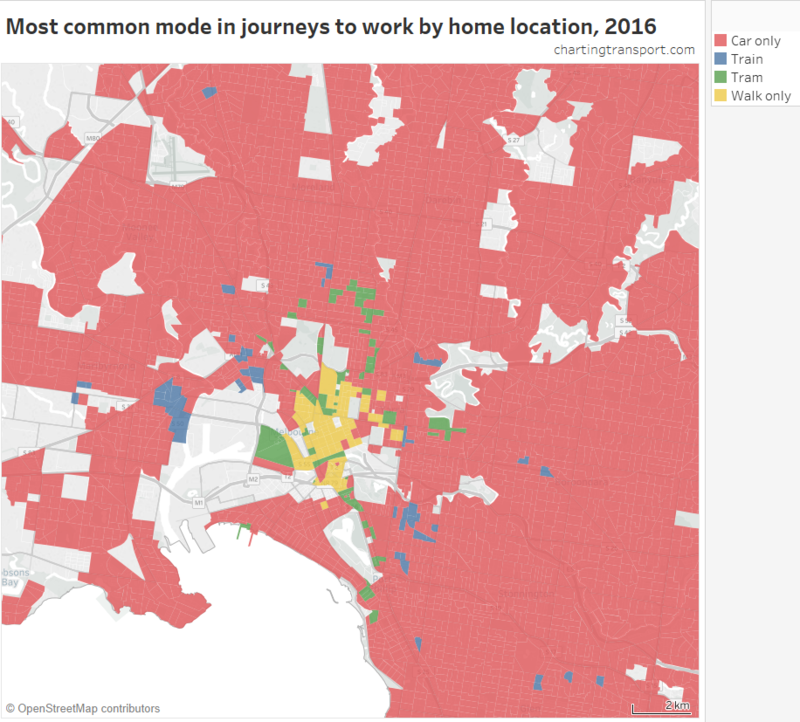 So you can ask questions such as “where did workers living in X commute to and how many used public transport?” or “where did workers in Y commute from and what percentage used private transport?”, or “What percentage of people in each home location work in the central city?”. It’s very possible to answer these questions with census data, but near-impossible to produce an atlas of maps that would answer most questions. But thanks to new data visualisation platforms, it’s now possible to build interactive tools that allow exploration of the data. I’ve built one in Tableau Public, using both 2011 and 2016 census data for all of Australia at the SA2 geography level (SA2s are roughly suburb sized). This means you can look at each census year, as well and the changes between 2011 and 2016. I’m going to talk through what I’ve built with plenty of interesting examples from my home city Melbourne. I hope you find exploring the data as fascinating and useful as I do. I also hope this tool makes it easier to inform transport discussions with evidence. Also, a warning that this is a longer post, so get comfortable. The census asks people which modes they used in the journey to work, and the data is encoded for up to three modes. Private (motorised) transport only – any journey involving car, truck, motorbike or taxi, but no modes of public transport, or people who only responded with “other”. Around 89% of journeys in this category were simply “car as driver”. Walking/cycling only (or “active transport”) – journeys by walking or cycling only. Public transport – any journey involving any public transport mode (train, tram, bus, and/or ferry). These journeys might also involve private motorised transport and/or cycling. There are 466,597 rows of data all up – so you will need to be a little patient while Tableau prepares charts for you. I’ve had to extract each state separately to stop the number of possible origin-destination combinations getting too large. This means that interstate journeys to work are not included in the data. 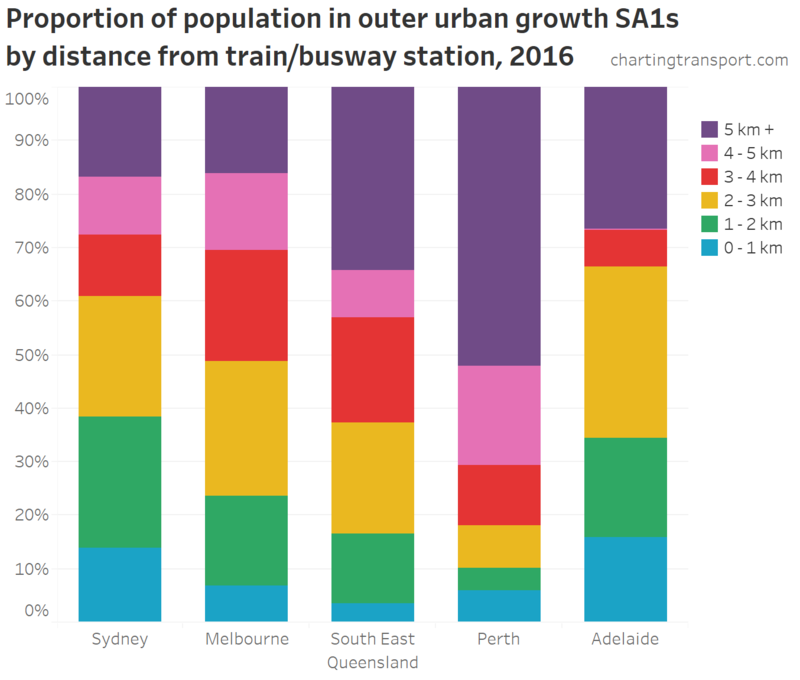 I have however combined New South Wales (NSW) and the small Australian Capital Territory (ACT), as many people commute between Queanbeyan (NSW) and Canberra (ACT). Apologies to other areas near state borders! When you ask the ABS for the number of people meeting certain criteria, the answer will never be 1 or 2. The ABS randomly adjust small numbers to protect privacy, and it’s not a good idea to add up lots of small randomly adjusted figures. That’s another reason why I haven’t gone smaller than SA2 geography and why I’ve aggregated mode combinations to just three modal categories. You will still see counts of 3 or 4, which need to be treated with caution. Not all SA2s are the same size in terms of residential population, and particularly in terms of working population. The biggest source of commuters for a work area might simply be an SA2 with a larger total residential population. The ABS change the SA2 boundaries between censuses. 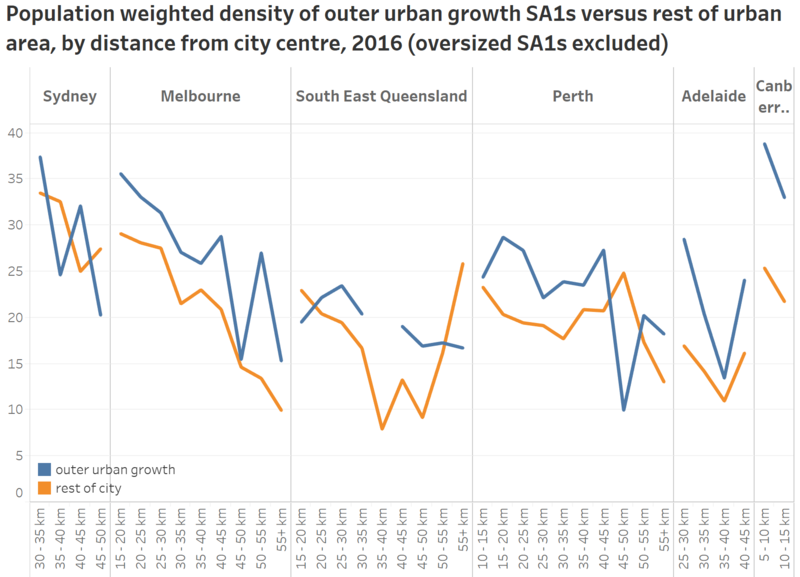 With each census some SA2s are split into smaller SA2s, particularly in fast growing areas. If you want to compare 2011 and 2016 figures, it is necessary to aggregate the 2016 data to 2011 boundaries, which the tool does where required. Some visualisation pages will give you the option of aggregating 2016 data to 2011 boundaries to make it easier to compare 2011 and 2016 data. I’ve only counted journeys where the origin, destination and mode are known. Anyone who didn’t go to work on census day, didn’t state their mode(s) of travel, or didn’t state a fixed land-based work location are excluded. Assigning “other” only trips as private transport might not be perfect, as it might include non-motorised modes like skateboards and foot scooters. It will also count air travel, and it’s arguable whether that is private or public transport (it’s certainly not low-carbon transport). 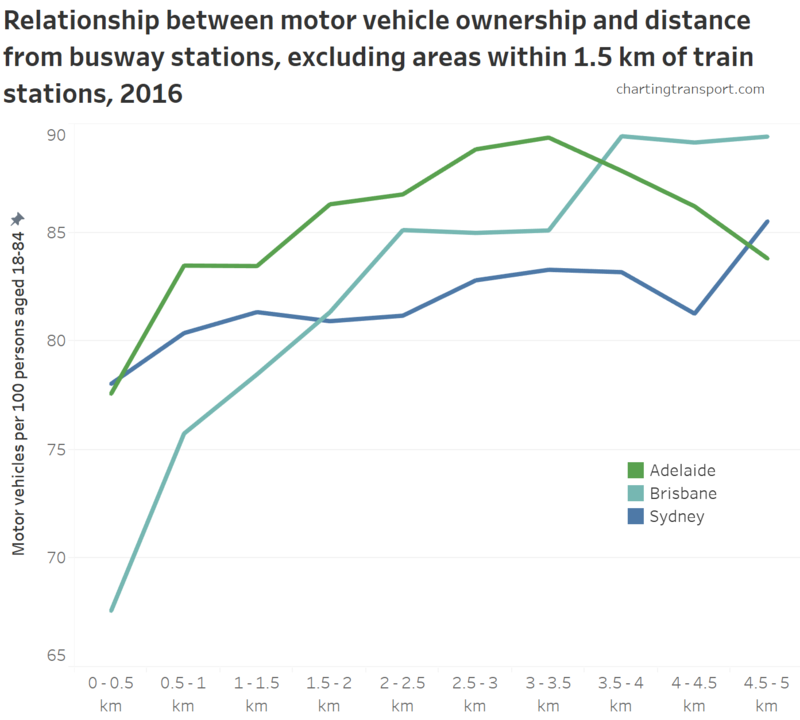 However, overall numbers are quite small – 0.81% of all journeys with a stated mode in Australia. First up, you can produce maps showing the main mode share of commuters from all home SA2 for a particular work SA2, or all workplaces for a particular home SA2. Private transport dominates most middle and outer work destinations (even local trips), with many at 100%. Lower shares are evident for central city destinations, although Southbank next to the CBD is relatively high at 65%, and 100% of commuters who travelled to Fishermans Bend did so by private transport. 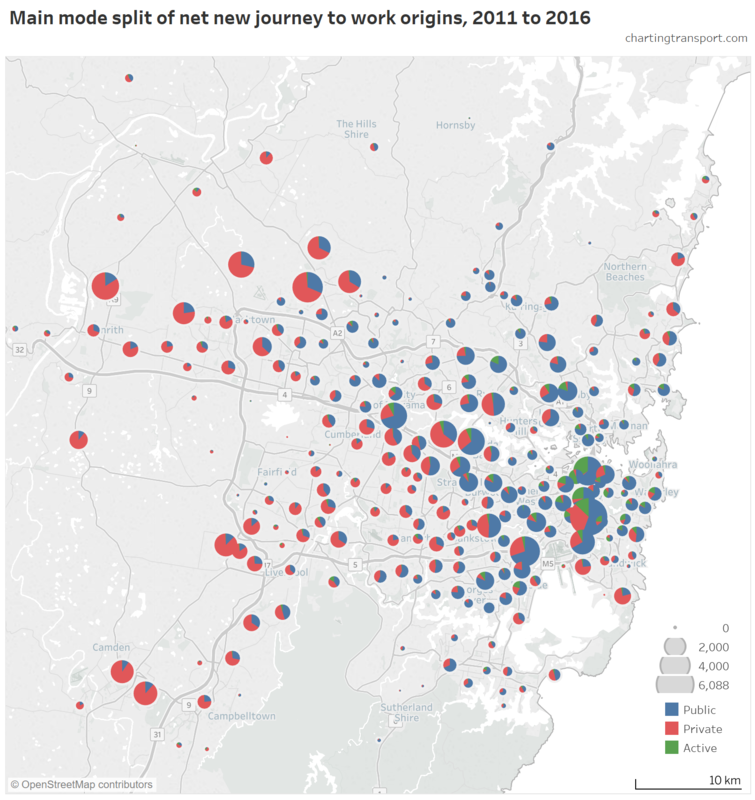 There was a low private transport mode share from the city centre and Brunswick to the north, roughly 40-50% mode shares from the south-eastern suburbs (accessible by train), but very high mode shares from the middle and outer suburbs to the north and west (public transport access more difficult). The new Metro Tunnel could make a dent in these mode shares, with a new train station in Parkville. 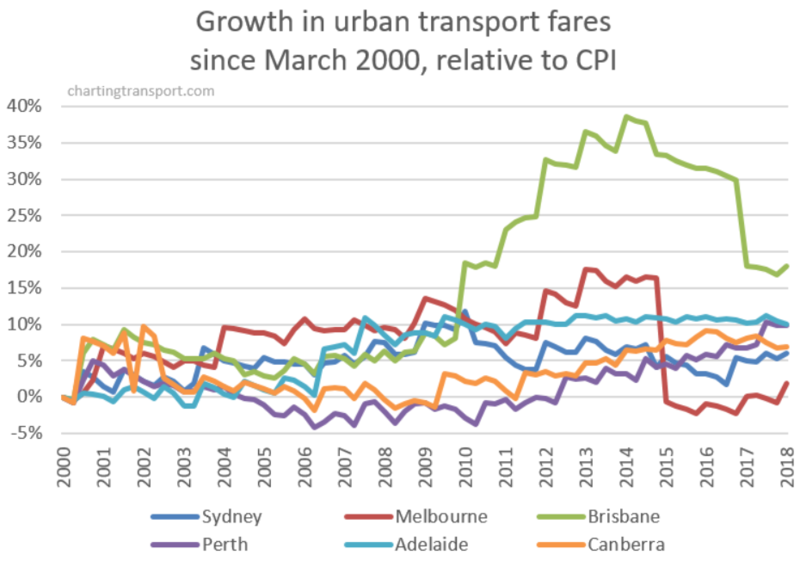 Private transport (only) mode shares were lower than 30% for most areas, as public and active transport options are generally cheaper and more convenient for travel to the CBD. However you can see corridors with higher private transport mode share, including Kew – Bulleen – Doncaster – Warrandyte, and Keilor East – Keilor – Greenvale (around Melbourne Airport). These corridors are more remote from heavy rail lines. Other patches of higher private mode share include Rowville – Lysterfield, Altona North, and Point Cook East (including Sanctuary Lakes). A high private transport mode share does not necessary mean a flood of private vehicles are coming from these areas. Kinglake is the rich orange area in the north-east of the above map, and according the 2016 census, 57% of people commuted to the Melbourne CBD by private transport only. Except that 57% is actually just 23 out of just 40 people making that commute – which is pretty small number in whole scheme of things. These maps show the volume (size of pie) and mode split for journeys from/to a selected SA2. 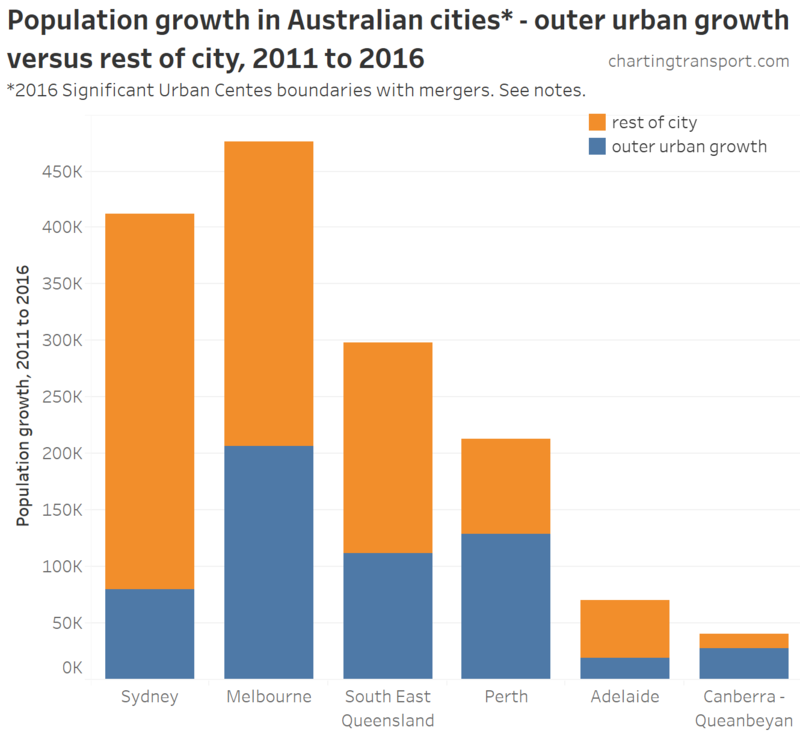 As I discussed in a recent post, not many people actually commute from the outer suburbs to the central city. Indeed, only 767 people commuted from Rowville to the Melbourne CBD in 2016, which is less than one train full. You can see large green wedges in the inner city, where walking or cycling to the CBD is practical. You can also see that almost everywhere the blue wedges (public transport) are much larger than the red (private transport). 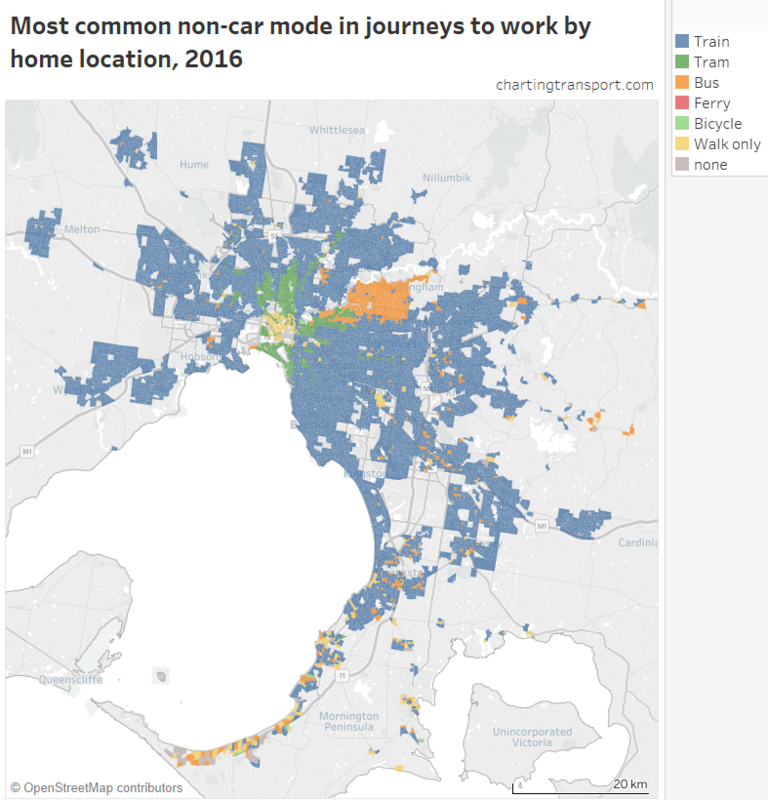 What does stand out more in this map is Kew – where 716 people travelled to the Melbourne CBD by private transport (highest of any SA2) – with a relatively high 41% mode share for a location so close to the city, despite it being connected to the CBD by four frequent tram and bus lines. Kew is also a quite wealthy area, so perhaps parking costs do not trouble such commuters (maybe employers are paying?). Other home SA2s with high volumes and relatively high private mode shares are Essendon – Alberfeldie (521 journeys, 28% private mode share), Brighton (493, 33%), Keilor East (419, 41%), Toorak (404, 35%) and Balwyn North (396, 35%). Most of these are wealthy suburbs, with the notable exception of Keilor East, which does not have a nearby train station. The home areas with significant numbers of Parkville commuters are in the inner northern suburbs, and active and public transport were the dominant mode share for these trips. While 92% of commuters from Burnside Heights to Parkville were by private transport, there were only 35 such trips. 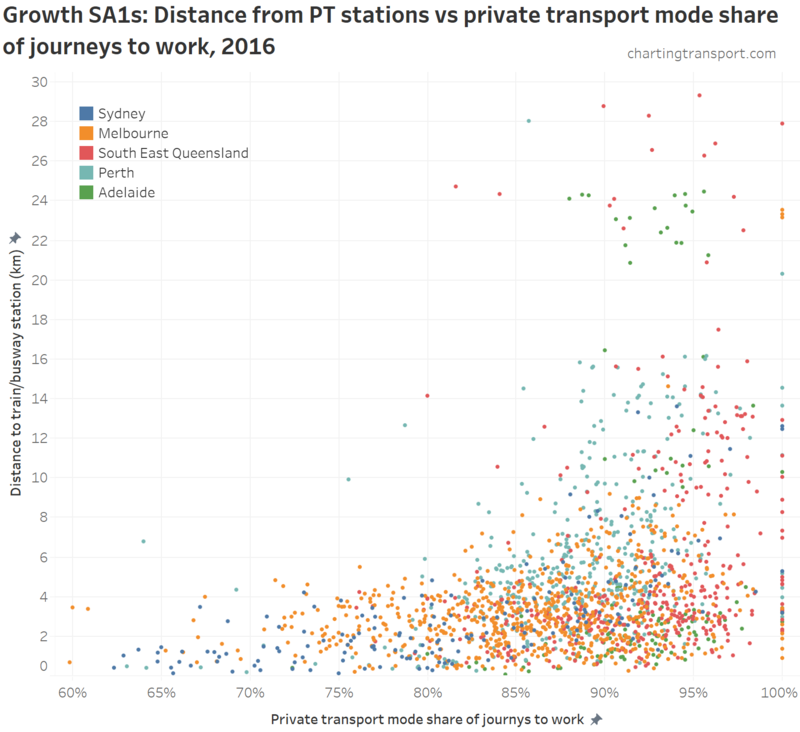 The overall private transport mode share for Parkville as a destination was 50%. 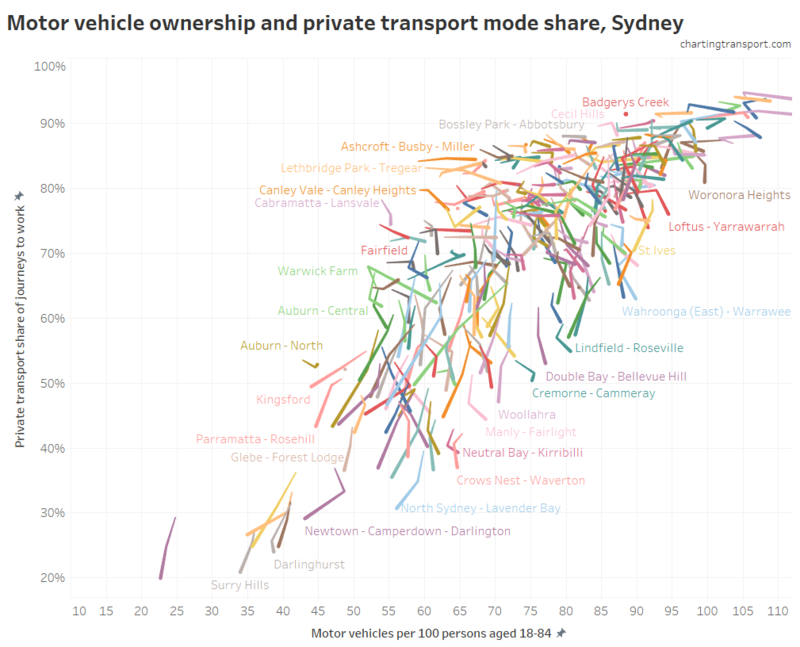 Private transport dominates mode share, and you can see a slight bias towards the western suburbs. Which means a lot of cars driving over the Westgate Bridge. 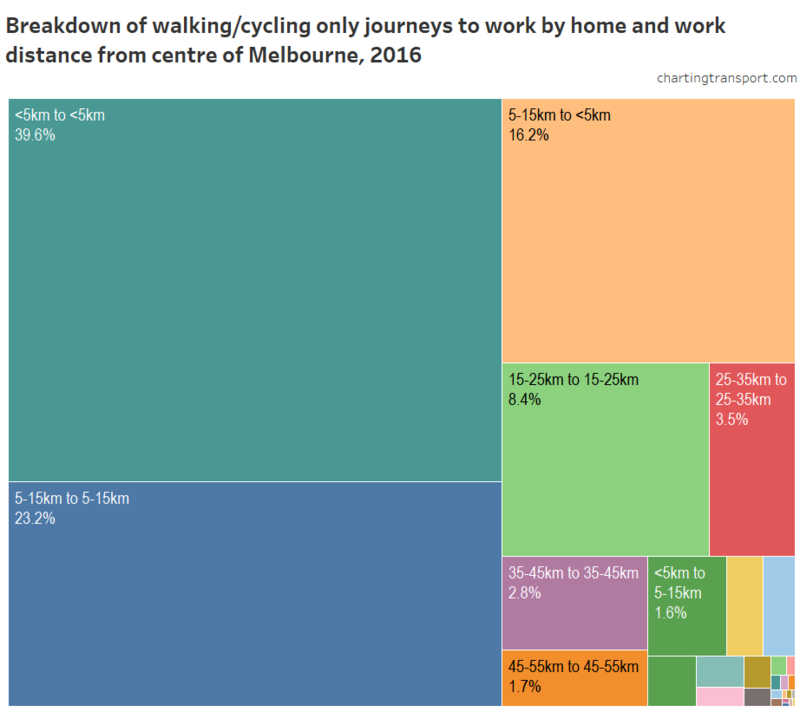 Almost half of the workers who both live and work in Clayton walked or cycled (only) to work, of which I suspect many work at Monash University. 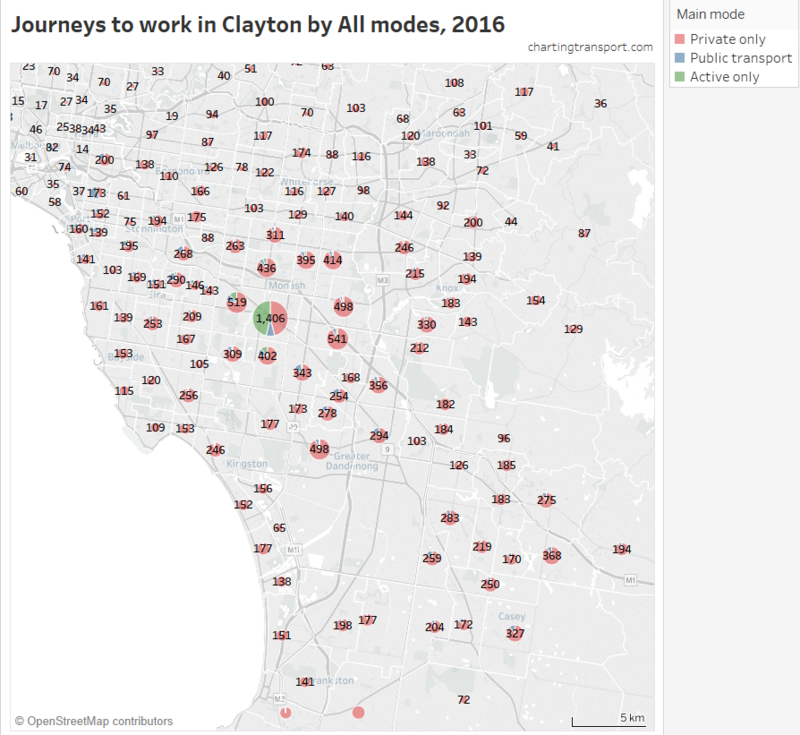 The public transport mode shares are higher towards the north-west, particularly around the Dandenong train line that connects to Clayton. Very few people put themselves through the pain of commuting from Melbourne’s western and northern suburbs to Clayton. You can see a significant proportion of the workforce lived to the south-east, and much less to the north and west. 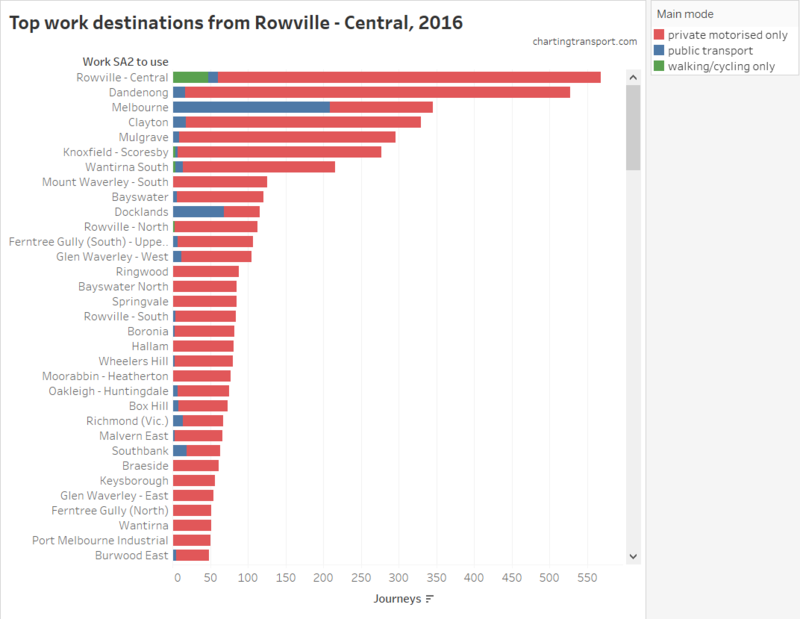 You can also see private transport dominates travel from all directions (despite there being two train lines through the Dandenong activity centre, and a north-south SmartBus route through the industrial area). You can see that airport workers predominantly came from the nearby suburbs, and the vast majority commuted by private transport. 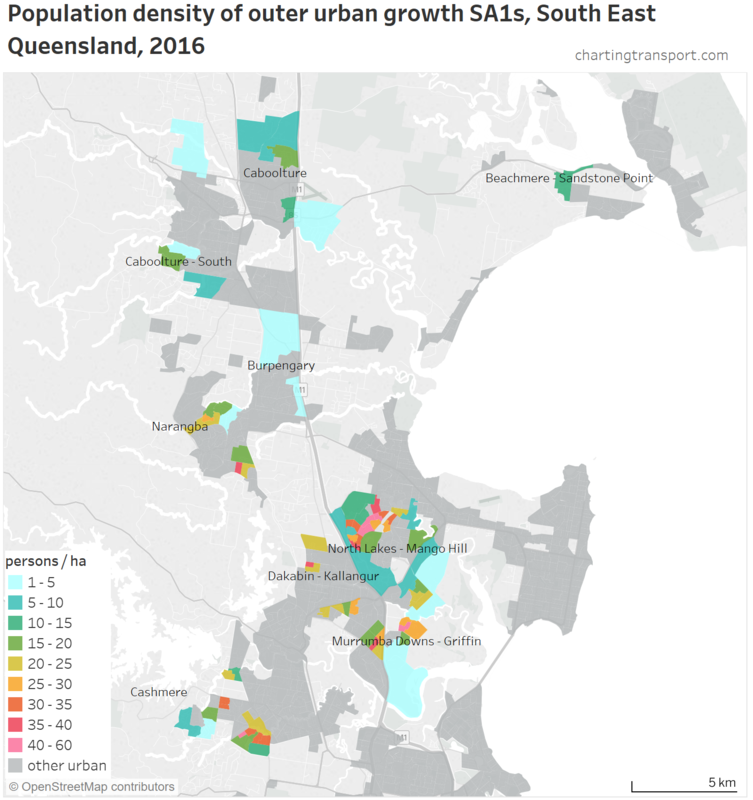 The most common home locations of airport workers include Sunbury South (543), Gladstone Park – Westmeadows (411), and Greenvale – Bulla (351 – note Greenvale has a much higher population than Bulla). 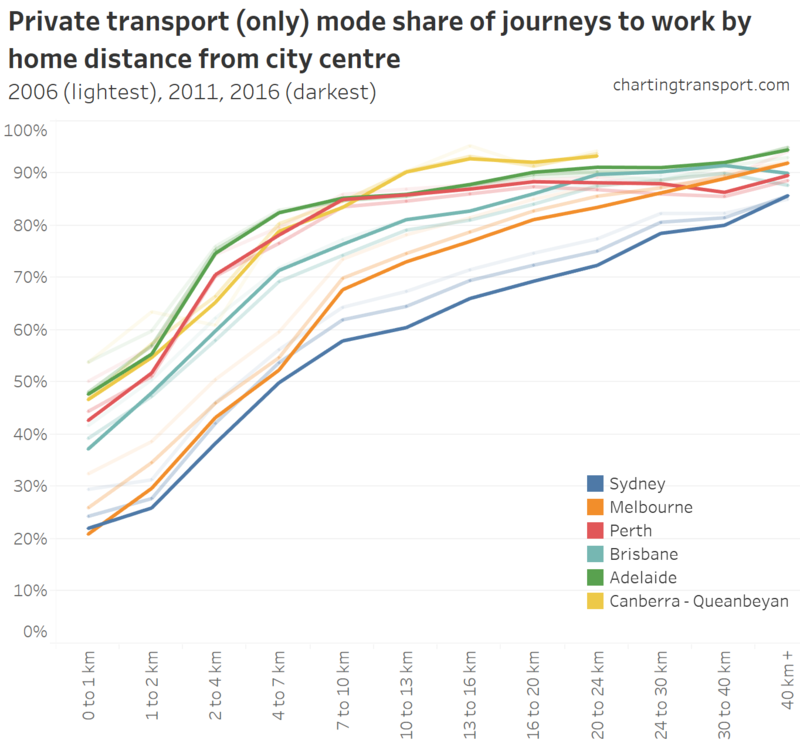 The largest public transport volume actually came from the CBD (48 out of 67 commuters, which is a 72% mode share), probably using staff discount tickets on SkyBus. The biggest trip growth 2011 to 2016 was from Craigieburn – Mickelham: 367 more trips of which 355 were by private transport only. 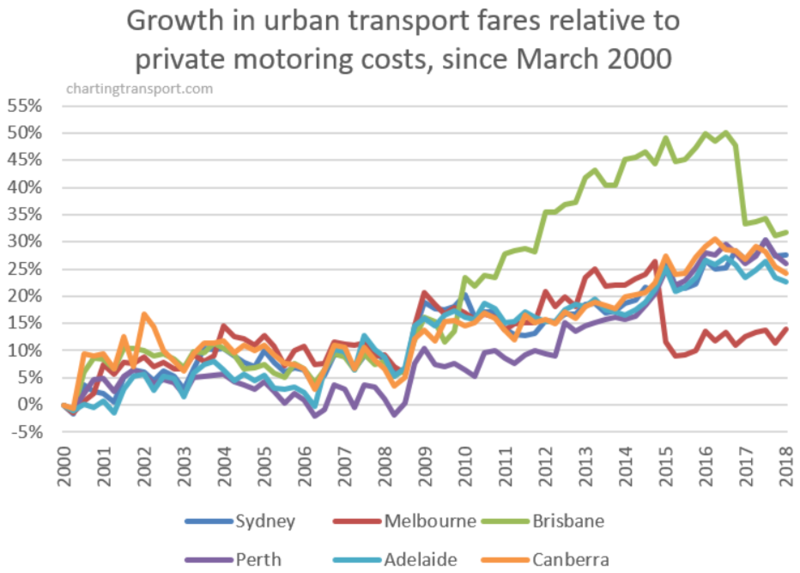 The most common sources of private transport trips to the CBD were generally very wealthy suburbs, where many people are probably untroubled by the cost of car parking (they can easily afford it, or someone else is paying). However bear in mind that not all SA2s have the same population so larger SA2s will be higher on the list (all other things being equal). This data can also be viewed the other way around. Here are the volumes and mode splits of journeys from Point Cook South in 2016. The Melbourne CBD was the biggest destination (994 journeys) with 69% public transport mode share followed by Docklands (342 journeys) with 64% public transport mode share. There are some interesting patterns in this map. 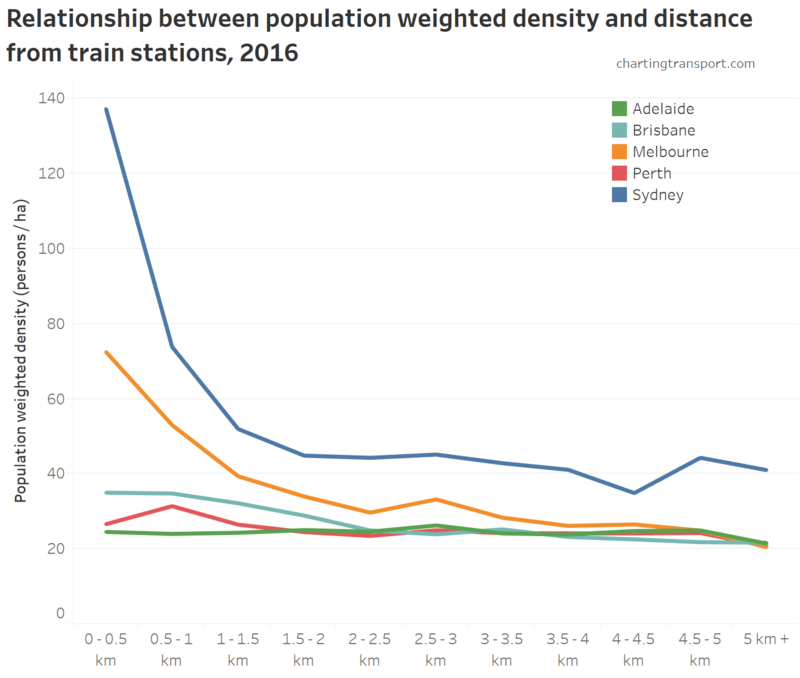 Generally the percentage of people commuting to central Melbourne declined with distance from the CBD. 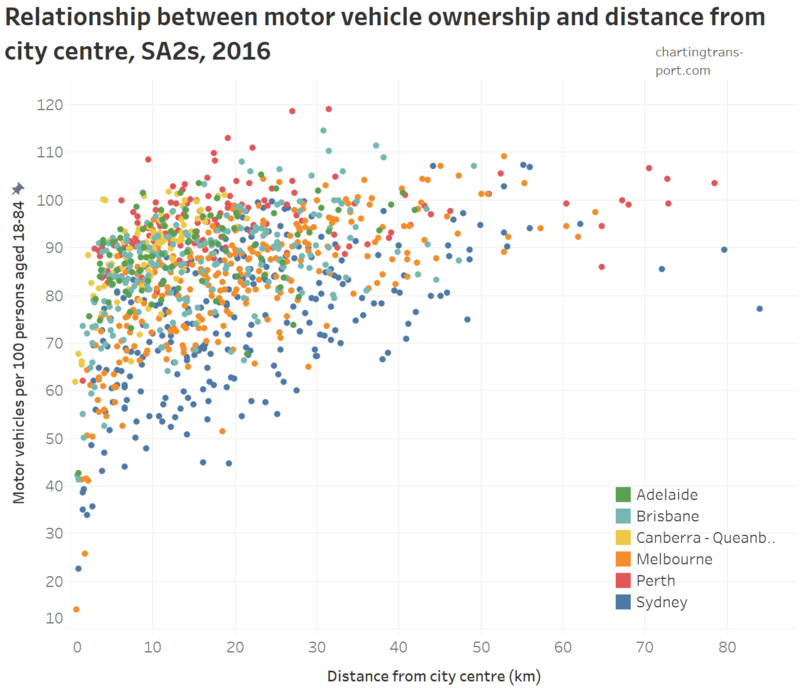 There are however some outlier SA2s that had relatively high percentages of people travelling to central Melbourne, despite being some distance from the city centre. Tableau has labelled some of the points, but not all (interact with the data in Tableau to explore more). 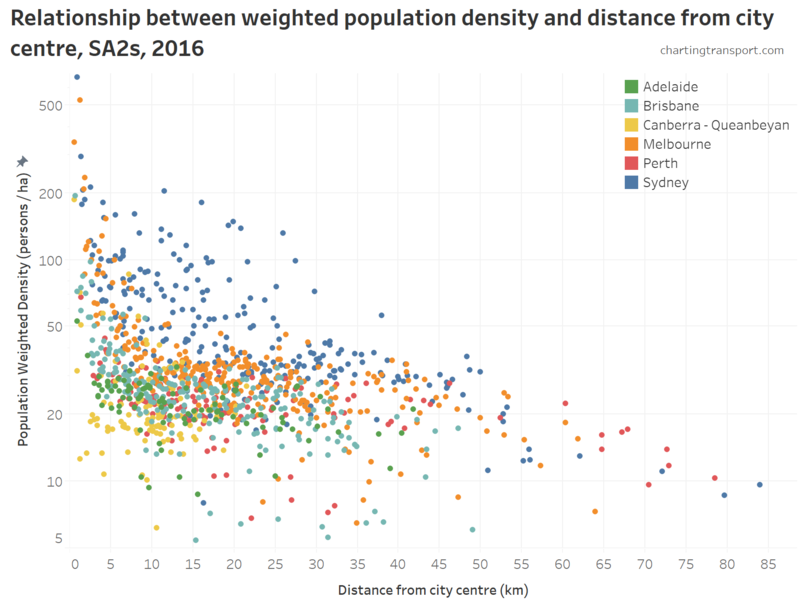 The outliers above the curve are generally west or north of the city, with Point Cook South being the most significant outlier. Further from the city, the commuter towns of Macedon, Riddells Creek and Gisborne have unusually high percentage of commuters travelling to the central city for that distance from the city (made possible by upgraded V/Line train services). Many of the outliers below the curve are less wealthy areas, where people were less likely to work in the central city. 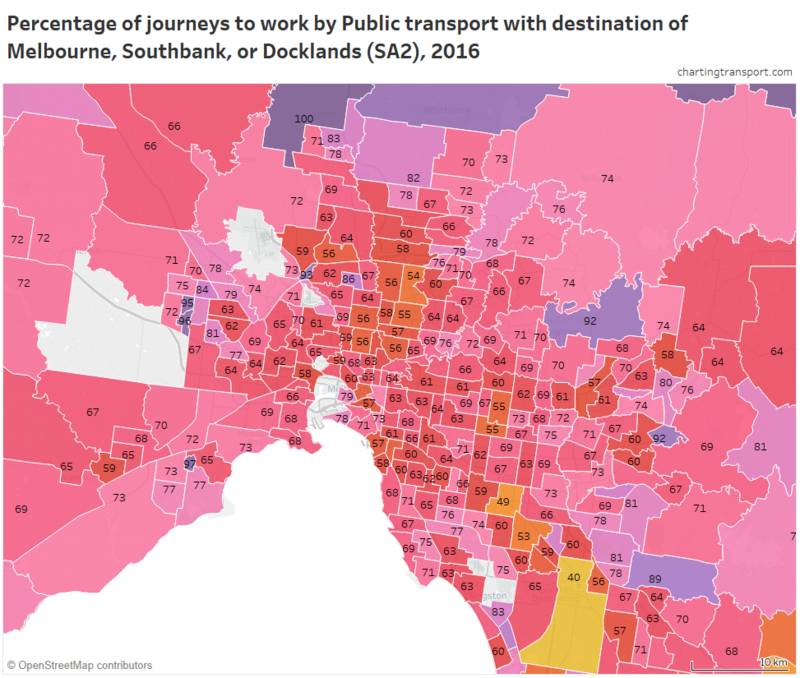 Typically around two-thirds of public transport journeys to work from most parts of Greater Melbourne are to Melbourne, Docklands, or Southbank SA2s. 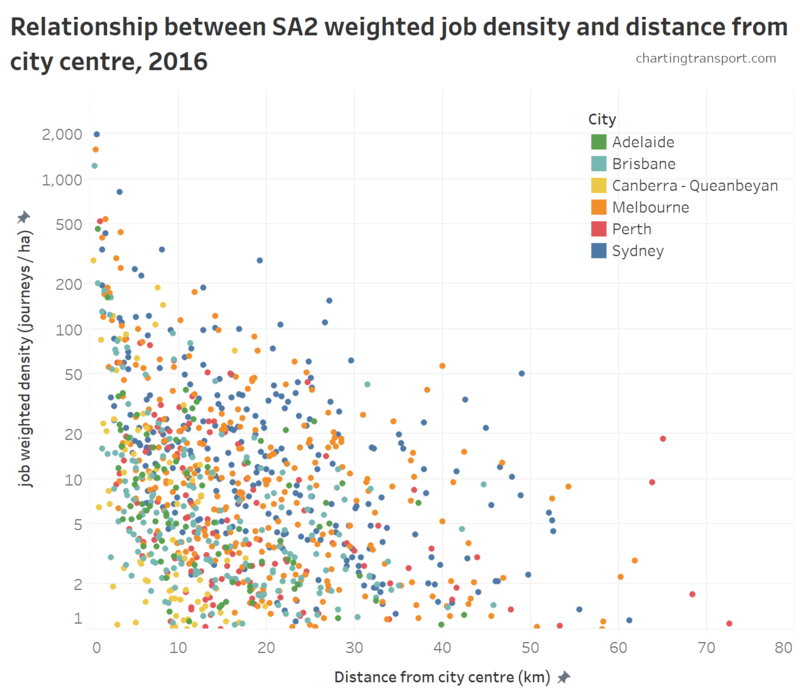 The lowest percentages were in the local jobs rich SA2s of Clayton (49%) and Dandenong (40%). 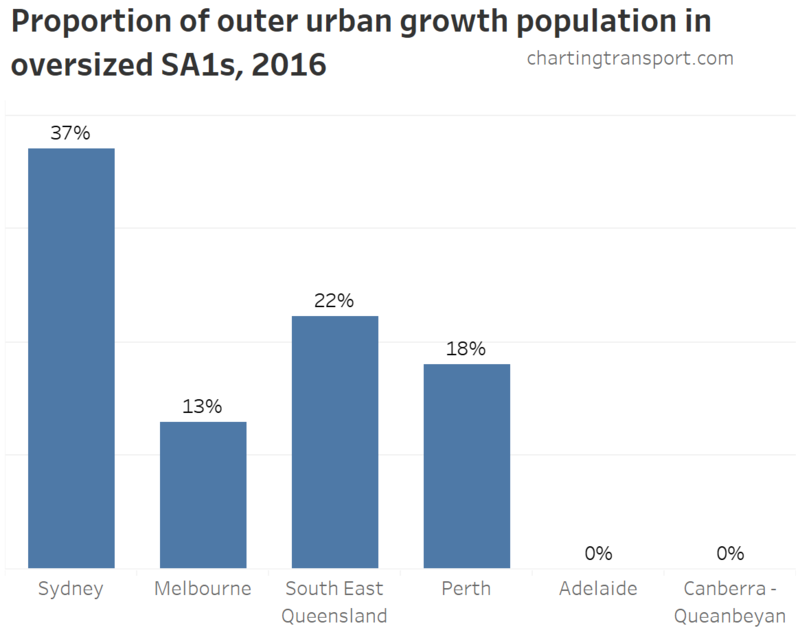 Adding Carlton and East Melbourne to the above three central city SA2s roughly takes the proportion up to around 70%. That’s a lot of public transport commutes to other destinations, but still a vast majority are focussed on the central city. Where do people from a particular area commute to? You can see that 20% worked in the Melbourne CBD, followed by 7% in Docklands, and 6% in each of Point Cook North and Point Cook South (local). The largest nearby employment area is the industrial areas of Laverton, but this industrial area only attracted 4% of commuters from Point Cook South. 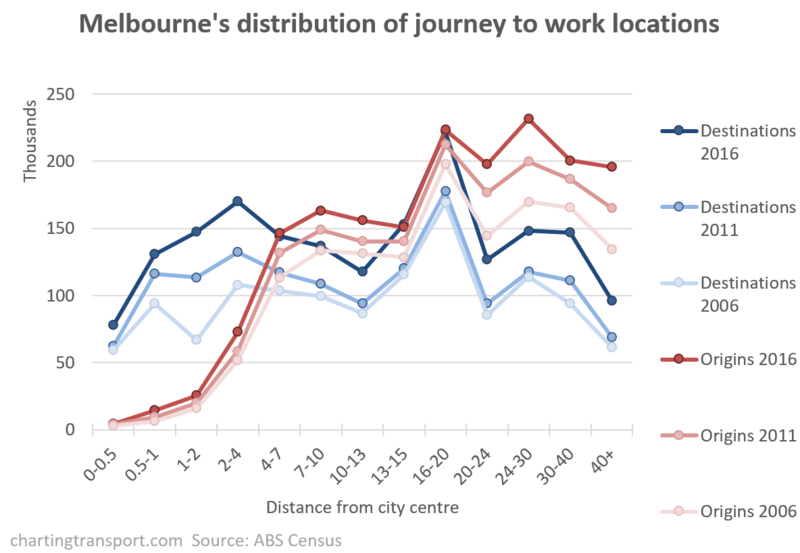 You can see that journeys to work are very scattered, with only 6% travelling to the Melbourne CBD. You can see local trips are most numerous, and are dominated by private transport (although there were 48 active transport local trips). 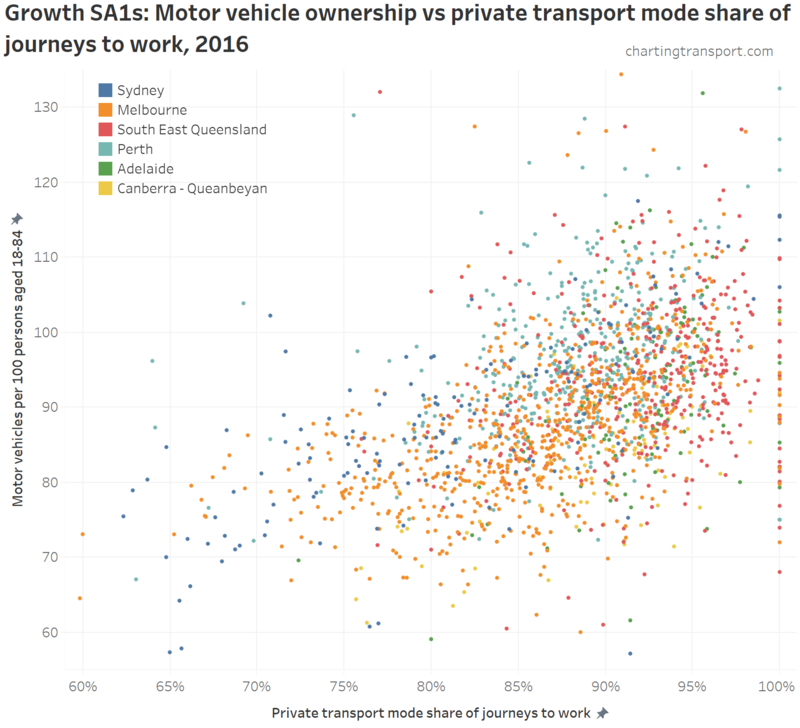 Dandenong was the second most common destination, with 97% private transport mode share, followed by Melbourne CBD with 40% private transport mode share (137 private transport journeys). 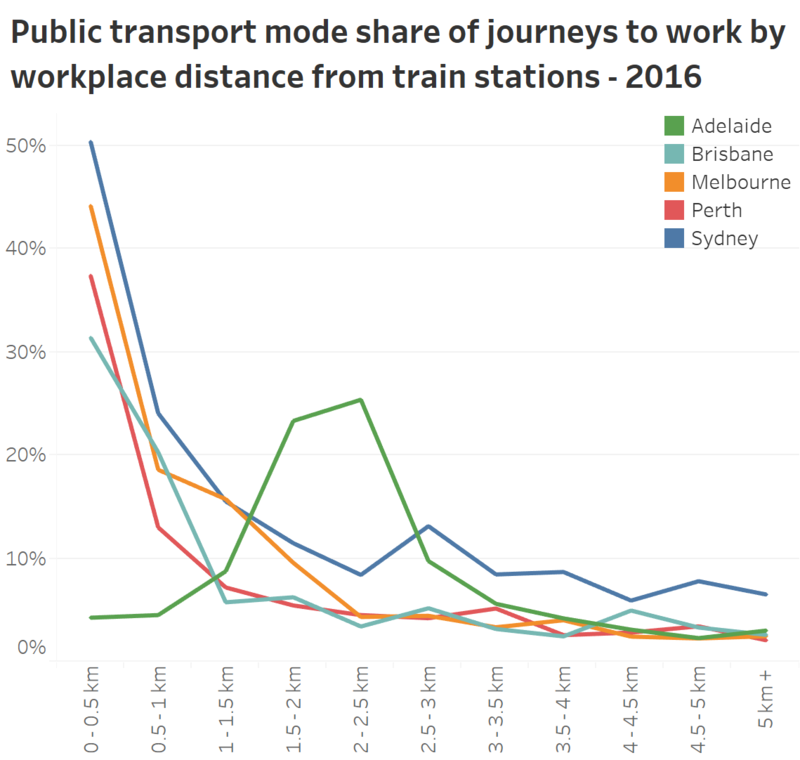 The only other destination with high public transport mode share was Docklands at 59% (48 private transport journeys). We’ve so far looked at volumes and mode shares, but of course we can also look at the changes in volumes and mode share between 2011 and 2016. You can see almost all of the new journeys to work were by private transport, no doubt putting a lot of pressure on the road network. 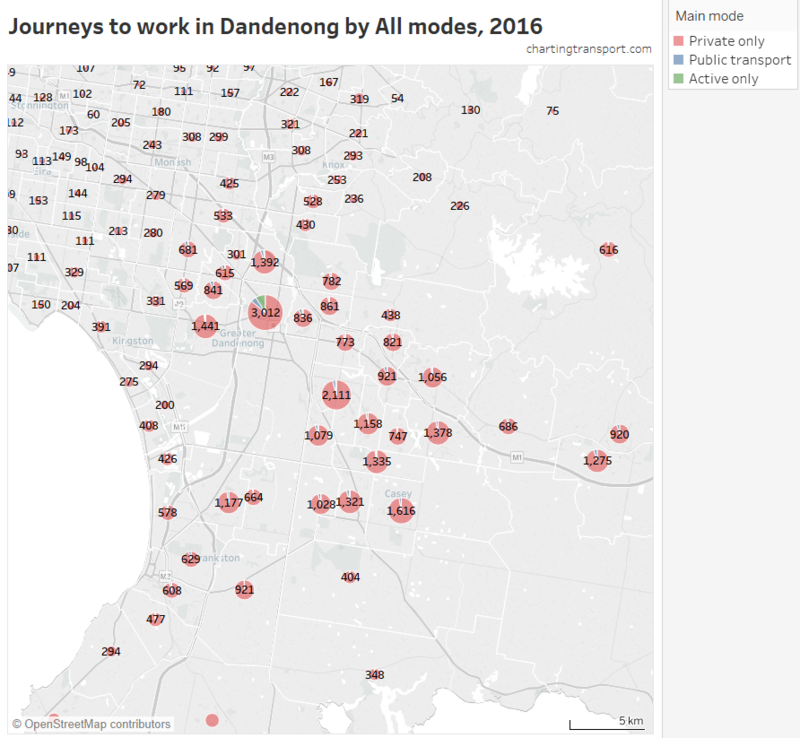 A lot of the growth was from the suburbs to the east and south-east, none of which had a direct public transport connection to the Dandenong South industrial area at the time of the 2016 census. That’s now changed, with new bus route 890 linking the Cranbourne train line at Lynbrook with the Dandenong South industrial area (it operates every 40 minutes). Note: a row with no figure or bar drawn (quite common in the Active only column) means that there were no such trips in either 2011 and/or 2016. Unfortunately the tool doesn’t show the change in volume in such circumstances (I’ll try to fix this in the future). Brunswick is Parkville’s biggest source of workers, and there were many more such workers coming in by public and active transport, and a decline in workers who commuted by private transport. However there was an increase in private transport from places further out like Coburg and Pascoe Vale. Access to the Melbourne CBD by public transport improved significantly with the new train station, and 527 more people did that trip in 2016 compared to 2011. But the number of people who drove declined by only 35. The train line didn’t reduce the number of people driving out of Tarneit in total, but there probably would have been a lot more had it not opened. In the case of the Melbourne CBD, there were simply a lot more CBD workers living in Tarneit in 2016 (some CBD workers may have moved to Tarneit, and people otherwise in Tarneit were probably more likely to choose the CBD for work). 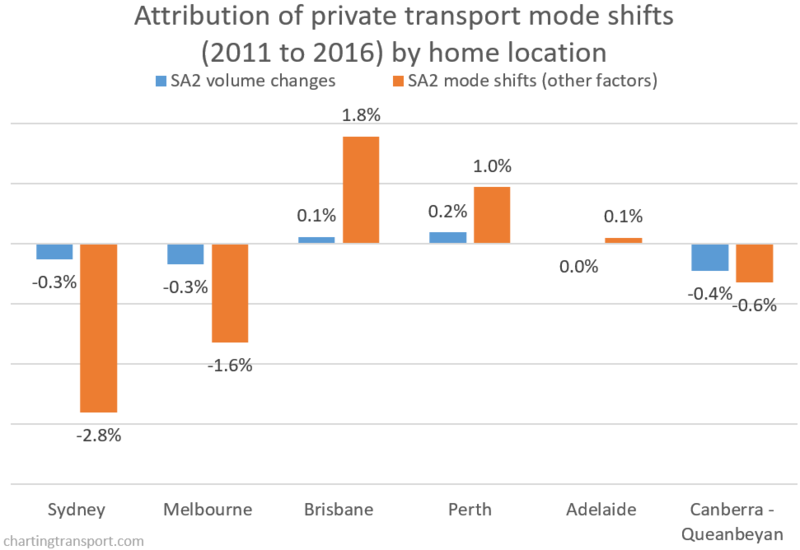 The biggest shifts away from private transport include Narre Warren North (-19%, but small volumes), Tarneit (-17%, with a train station opening in 2015), Wyndham Vale (-15%, also new train station), Don Vale – Park Orchards (-15%, with buses being primary mode for access to the CBD), Melton (-13%), and then -12% in Point Cook (new train station and bus upgrades in 2013), West Footscray – Tottenham, Sunbury (rail electrification 2012), South Morang (new train station), and Warrandyte – Wonga Park (SmartBus to city). 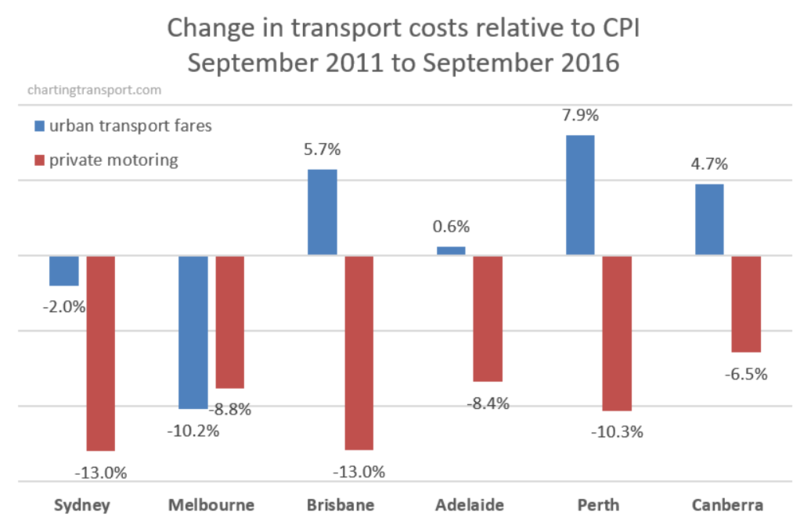 The biggest mode shifts to private transport were in low volume areas, including Monbulk – Silvan (+14%, which is an extra 5 trips), Keilor (+8%, 8 extra trips), Tullamarine (+8%, 16 extra trips), Lysterfield (+7%, 4 extra trips), Panton Hill – St Andrews (+7%, 4 extra trips) and more surprisingly Coburg North (+6%, up from 47 to 97 trips). Again, you can see the problem with mode share and mode shift figures is that the volumes may be inconsequential. The map doesn’t show regions with less than 30 travellers, or less than 4 travellers by the selected mode. There was an overwhelming mode shift away from private transport for travel to the Melbourne CBD. That’s a peculiar mix of increases in decreases, but most of the volume changes are relatively small (note the scale). The biggest increase was +142 trips from Truganina, a growth area with two nearby train stations built between 2011 and 2016. If that sounds alarming, it should be compared with an increase of 555 public transport trips from Truganina to the Melbourne CBD. -61 from Deer Park – Derrimut (also bus and train service upgrades). 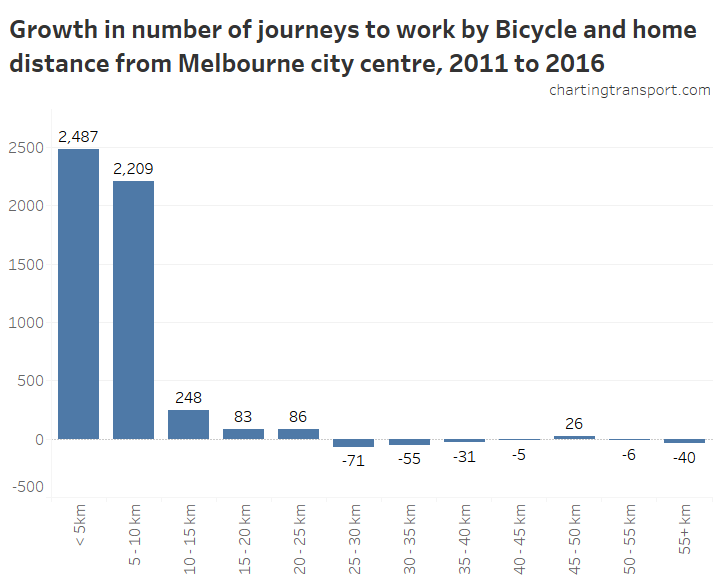 Curiously, there was an increase of 71 private transport journeys to work entirely within the Melbourne CBD (to a new total of 236). Why anyone living and working in the CBD would go by private transport is almost beyond me – it’s very walkable and the trams are now free. Digging deeper…in 2016: 137 drove a car, 20 were a car passenger, 17 used motorbike/scooter, 13 a taxi, and 31 were “other” (okay, some of those 31 might have been skateboards or kick scooters, but we don’t know). Wyndham Vale added more trips to the Melbourne CBD than trips to local workplaces. As mentioned, I’ve built interactive visualisations for all of this data, in Tableau Public, which you can use for free. If you have a reasonably large screen, you might want to start with one of these four “dashboards” that show you volumes and mode shares, or volume changes and mode shifts. Choose a state, then an SA2, then you might need to zoom/pan the maps to show the areas of interest (unfortunately I can’t find a way to change the map zoom to be relevant to your selected SA2). The good thing about these dashboards is that you see mode shares and volumes on the same page. Play around with the various filtering options to get different views of the data, including an option to turn on/off labels (which can overlap a lot when you zoom out), and change the colour scheme for mode share maps. Once you have the tool open in Tableau Public you can switch between the dashboards and worksheets with the tabs at the top (note: it will reset if you don’t use it for a while). You can mouse over the data to see more details (I’ve tried to list relevant data for each area), and often your filtering selections will apply to related tabs. A large mode share or mode shift might not be for a significant volume. A large change in volume might not be a significant mode shift. Post updated 11 May 2018. See end of post for details. 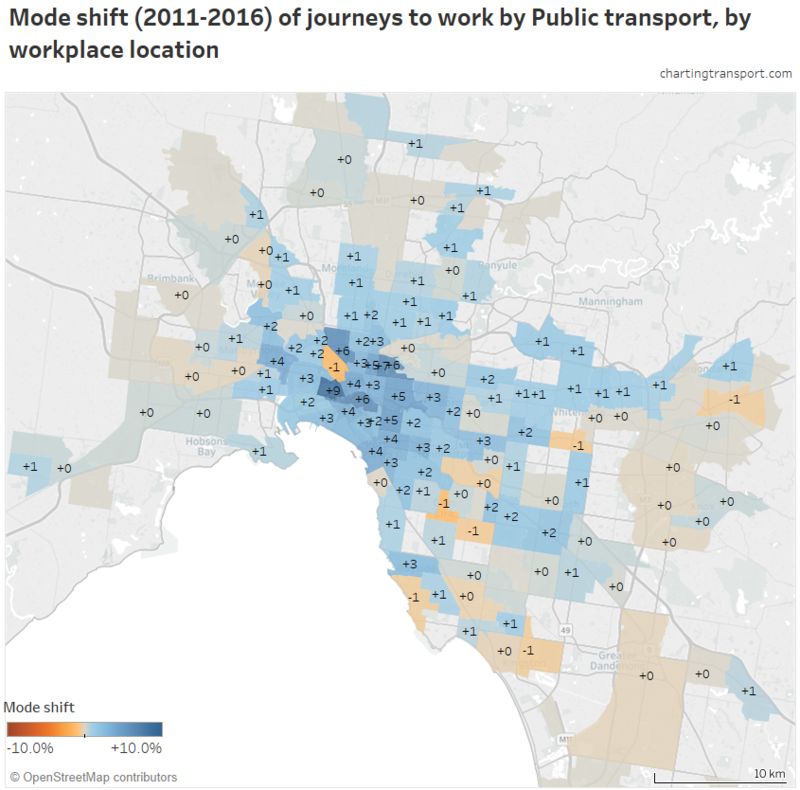 My last post looked at the overall trends in journeys to work in Melbourne, with a focus on public and private transport at the aggregate level. This post dives down to look at particular modes or modal combinations, including mode shares, mode shifts and the origins and destinations of new trips. The highest train mode shares can be seen mostly along the train lines, which will surprise no one. In fact, we can measure what proportion of train commuters live close to train stations. 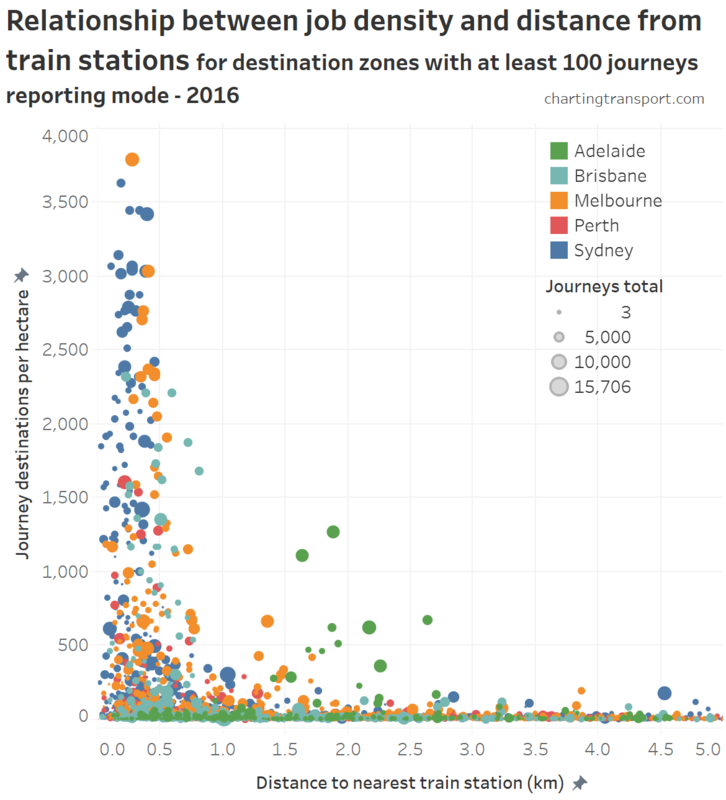 The following chart looks at how far commuters live from train stations, for commuters who use only trains, used trains and possible other modes, and for all commuters. 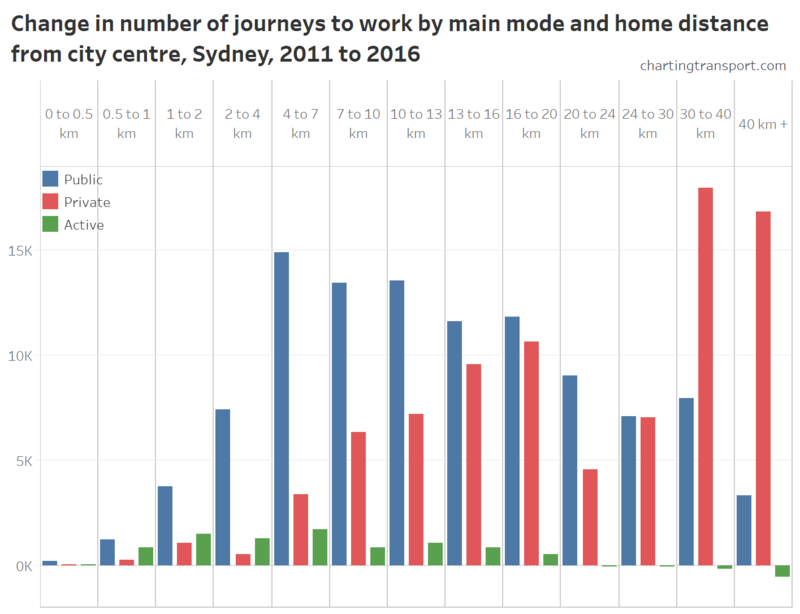 This chart shows that almost 60% of people who only used train (and walking) to get to work lived within 1 km of a station, and almost three-quarters were within 1.5 km. But around 8% of people only reporting train in their journey to work were more than 3 km from a train station. That’s either a long walk, or people forgot to mention the other modes they used (a common problem it seems). For journeys involving train, 50% were from within 1 km of a station, but around a quarter were from more than 2 km from a station. 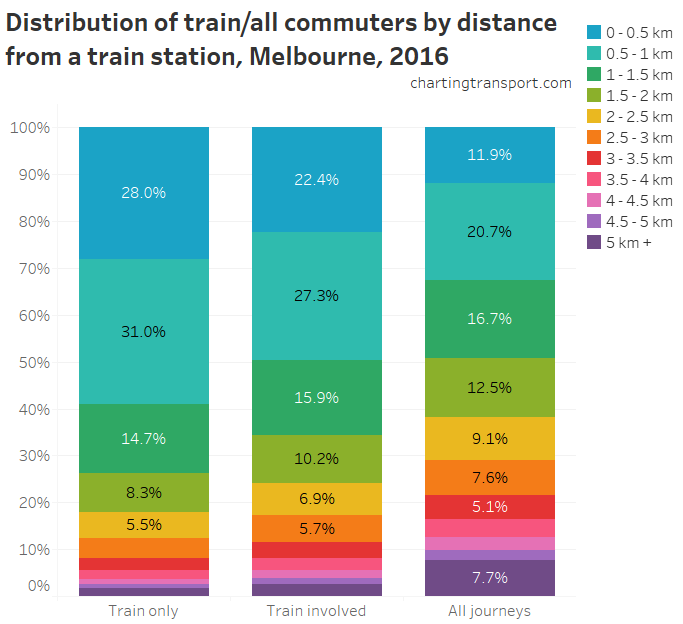 Interestingly, around a third of all Melbourne commuters lived within 1 km of a train station, but a majority of them did not actually report train as part of their journey to work. So where were the mode shifts to and from train (by home location)? There were big mode shifts to train around new stations including Wyndham Vale, Tarneit, Lynbrook, South Morang, and Williams Landing. 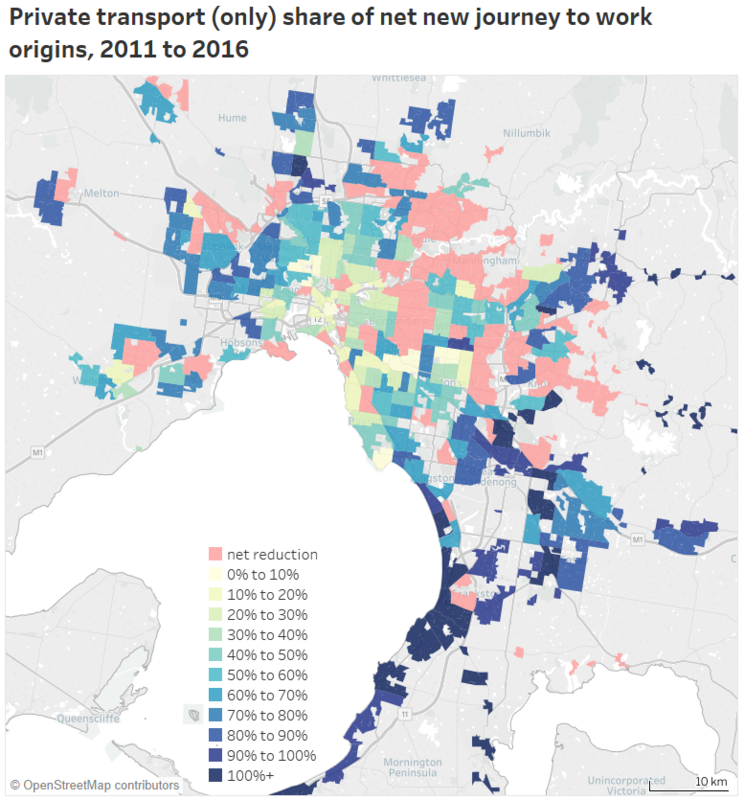 Other bigger shifts were in West Footscray – Tottenham, South Yarra – East, Brighton, Viewbank – Yallambie, Yarrville, Footscray, Kensington, and Pascoe Vale (some of which might be gentrification leading to more central city workers?). There was also a significant shift to trains in Point Cook, which doesn’t have a train station, but is down the road from the new Williams Landing Station. 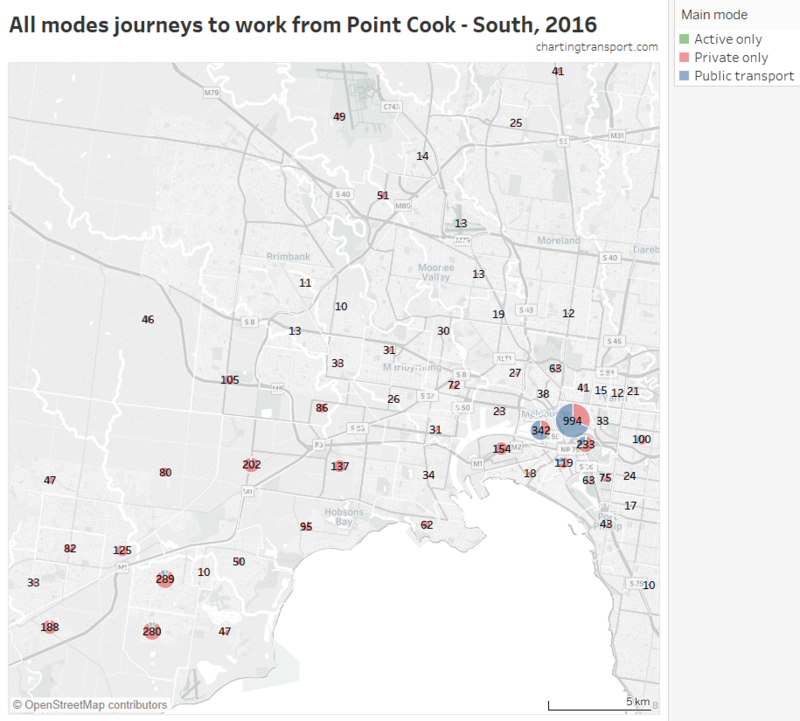 Almost 28% of commuters from Point Cook South work in the Melbourne CBD, Docklands or Southbank, and most of those journeys were by public transport. The highest shares are in the CBD, Docklands and East Melbourne. Notable relatively high suburban shares include the pocket of Footscray containing State Trustees office tower (30.7% in 2016), a pocket of Caulfield including a Monash University campus (29.5%), Box Hill (up to 19.6%), Swinburne University in Hawthorn (37.4%), and 17.5% in a pocket of Yarraville. 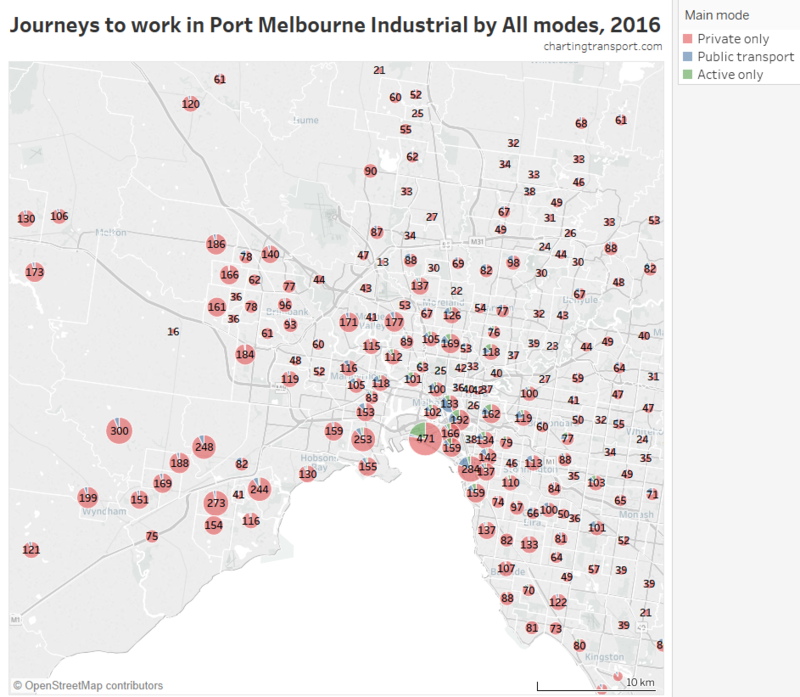 The biggest workplace mode shifts to train were in Docklands (+8.6%), Southbank (+5.5%), Abbotsford (+5.5%), Richmond (+5.3%), Collingwood (+5.1%), Parkville (+4.9%), and South Yarra – East (+4.8%). The highest bus mode shares are in the Kew-Doncaster corridor, around Clayton (Monash University), in the Footscray – Sunshine corridor, a pocket of Heidelberg West, around Box Hill and in Altona North. 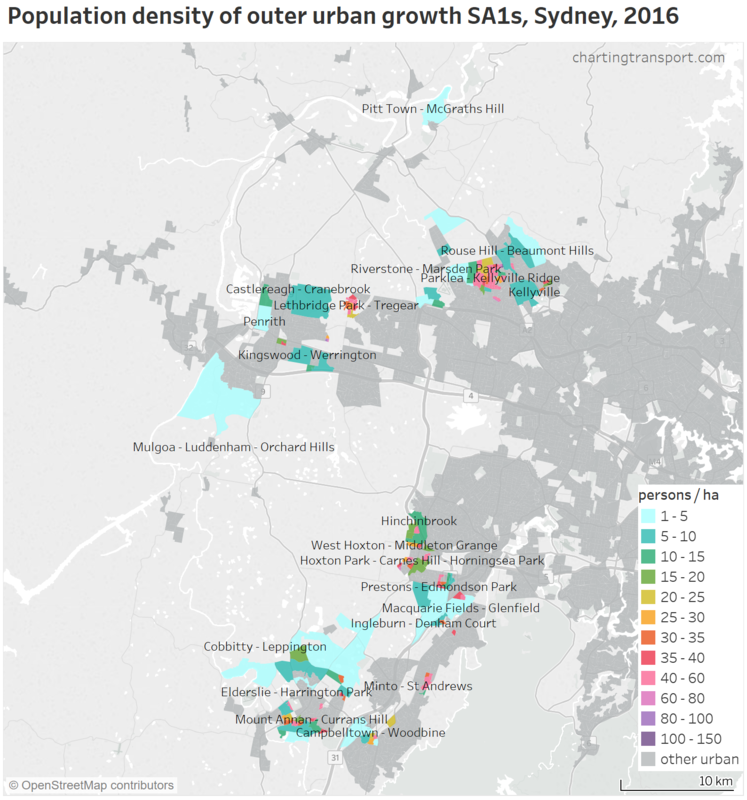 These are areas of Melbourne with higher bus service levels (and most lack train and tram services). Outside the Kew – Doncaster corridor there were small mode shifts in pockets that received bus network upgrades between 2011 and 2016, including Point Cook, Craigieburn, Epping – West, Mernda, Port Melbourne, and Cairnlea. There was also a shift to buses in Ormond – Glenhuntly, which can be largely explained by Bentleigh and Ormond Stations being closed on census day due to level crossing removal works, with substitute buses operating. There were larger declines in Dandenong, Footscray, and Abbotsford. In terms of workplaces, Westfield Doncaster topped Melbourne with 14.4% of journeys involving bus, followed by Monash University Clayton with 12.8% (remember this figure does not include students who didn’t also work at the university on census day), 13.3% at Northland Shopping Centre, and 12.3% in a pocket of Box Hill. “SmartBus” services operate from 5 am to midnight weekdays, 6 am to midnight Saturdays, and 7 am to 9 pm Sundays, with services every 15 minutes or better on weekdays from 6:30 am to 9 pm, and half-hourly or better services at other times. These are relatively high service levels by Melbourne standards. SmartBus includes four routes that connect the city to the Manningham/Doncaster region via the Eastern Freeway, three orbital routes, and a couple of other routes in the middle south-eastern suburbs. All routes are relatively direct and none are particularly short. Seven of these routes serve the Manningham region. To assist analysis, I’ve created a “SmartBus zone” which includes all SA1 and CD areas which have a centroid within 600 m of a SmartBus route numbered 900-908. These routes were all introduced between 2006 and 2011, generally replacing existing routes that operated at lower service levels (I’ve excluded SmartBus route 703 because it was not significant upgraded between 2006 and 2016). In 2006 the SmartBus zone already had double the bus mode share of the rest of Melbourne, as existing routes had relatively good service levels, including Eastern Freeway services. Following SmartBus (and other bus) upgrades between 2006 and 2011, there was a 2.5% mode shift to bus in the SmartBus zone, and a 1.3% mode shift to bus elsewhere. The SmartBus zone had a further 0.5% shift between 2011 and 2016 while the shift was only 0.2% in the rest of Melbourne. Here’s an animated look at bus mode shares for just the SmartBus zone. You can see plenty of mode shift in the Manningham area (where many SmartBus routes overlap), but also some mode shifts along the others routes – particularly in the south-east. the SmartBus zone includes overlaps with some other high service bus routes – those pockets generally had higher starting mode shares in 2006. The orbital SmartBus routes do overlap with trains and/or trams which provide radial public transport at high service levels, negating the need or bus as a rail feeder mode (still useful for cross-town travel). I haven’t excluded sections of SmartBus freeway running from the SmartBus zone. Sorry, I know that’s not perfect analysis, particularly along the Eastern Freeway. Journeys involving train and bus rose from 1.1% in 2006 to 1.5% in 2011 and 1.7% in 2016, which is fairly large growth off a small base and represents around half of all journeys involving bus. I suspect there might be some under-reporting of bus in actual bus-train journeys, as we saw many people a long way from train stations only reporting train as their travel mode. Large increases are evident around the middle eastern suburbs (particularly around SmartBus routes), the Footscray-Sunshine corridor (which have frequent bus services running to frequent trains at Footscray Station), Point Cook (where relatively frequent bus routes feeding Williams Landing Station were introduced in 2013, resulting in 750 train+bus journeys in 2016), Craigieburn (again bus service upgrades with strong train connectivity), and Wollert (likewise). Ormond – Glen Huntly shows up in 2016 because of the rail replacement bus services at Bentleigh and Ormond Stations at the time (as previously mentioned). Here’s a map of tram mode shares, overlaid on the 2016 tram network (there haven’t been any significant tram extensions since 2005). Higher tram mode shares closely follow the tracks, with the highest shares in Brunswick, North Fitzroy, St Kilda, Richmond, and Docklands. It’s also interesting to note that several outer extremities of the tram network have quite low tram mode shares – including East Brighton, Vermont South, Box Hill, Camberwell / Glen Iris (where the Alamein line crosses tram 75), Carnegie, and to a lesser extent Airport West and Bundoora. These areas have overlapping train services and/or are a long travel time from the CBD. The biggest mode shift was +13% in Docklands, followed by +10% in the CBD. This no doubt reflects the introduction of the free tram zone across these areas. 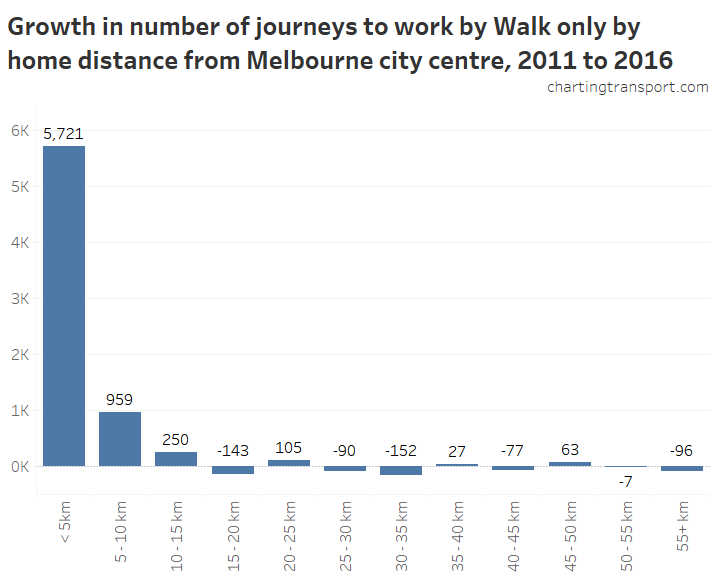 Walk-only journey to work mode share fell 4% in Docklands and 6% in the CBD. Abbotsford had a 9% mode shift to trams, which possibly reflects the extension of route 12 to Victoria Gardens, providing significantly more capacity along Victoria Street (the only tram corridor serving Abbotsford). There were small mode share declines in many suburbs, although this does not necessarily mean a reduction in the number of journeys by tram. In Port Melbourne there was a shift from tram to bus and bicycle. 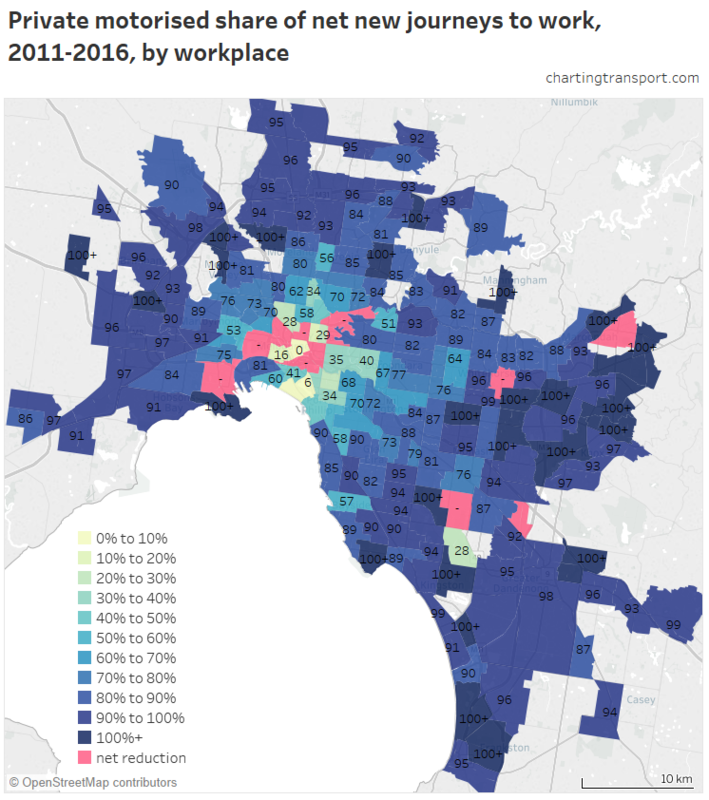 The highest workplace tram mode shares were in the CBD, along St Kilda Road south of the CBD, Carlton, Fitzroy, Parkville, Albert Park, South Melbourne, and St Kilda. Cycling mode share increased from 1.5% in 2006 to 1.8% in 2011 and 1.9% in 2016. 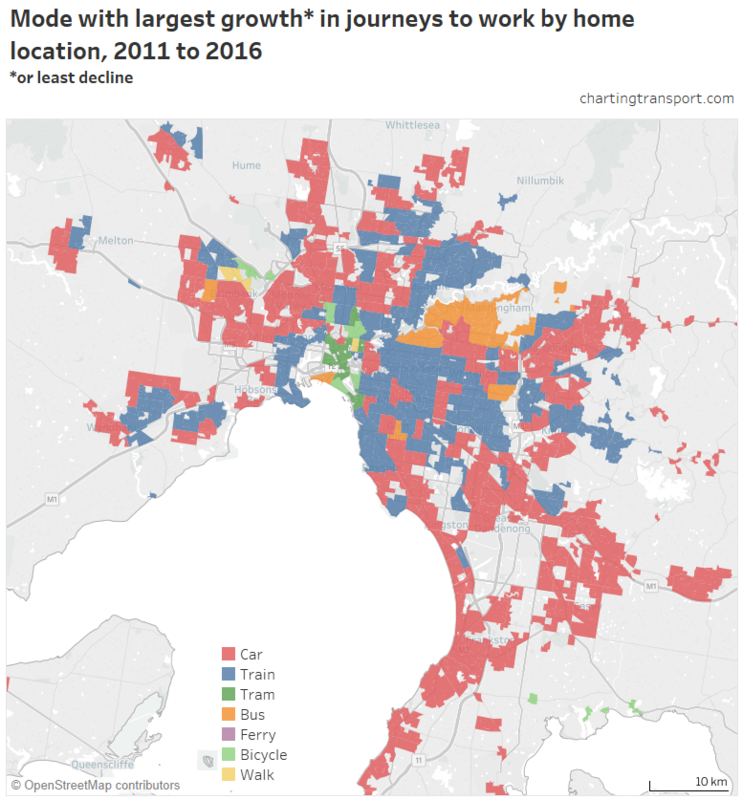 These are low numbers, but the bicycle mode share was anything but uniform across Melbourne. 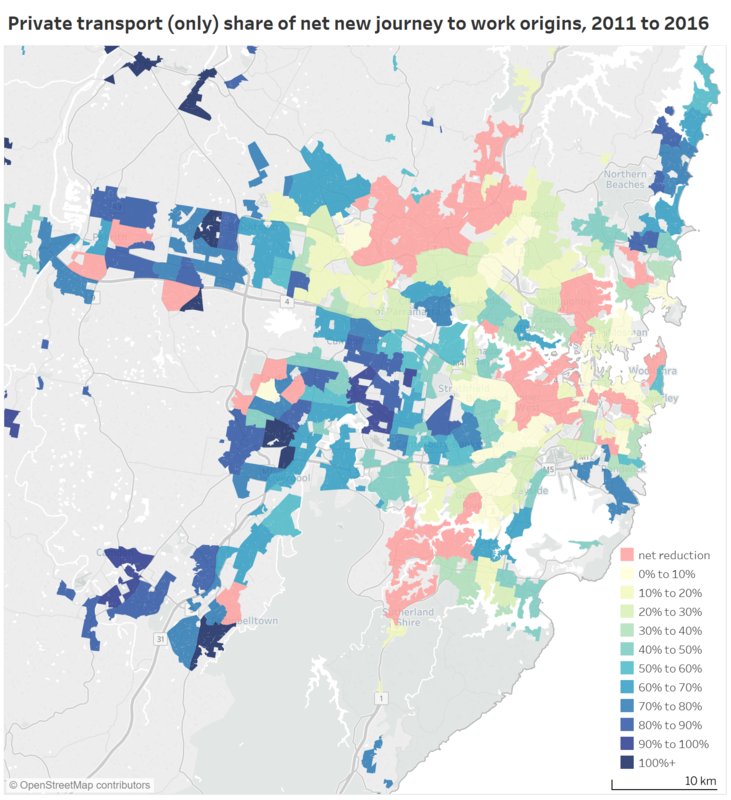 The highest mode shares are in the inner northern suburbs (pockets around 25%) where there has been considerable investment in cycling infrastructure. The biggest mode shift were 2% in Brunswick West and South Yarra West. However aggregating to SA2 level hides some of the other changes. If you study the detailed map you can see larger mode shifts in more isolated pockets and/or corridors (including a corridor out through Footscray). 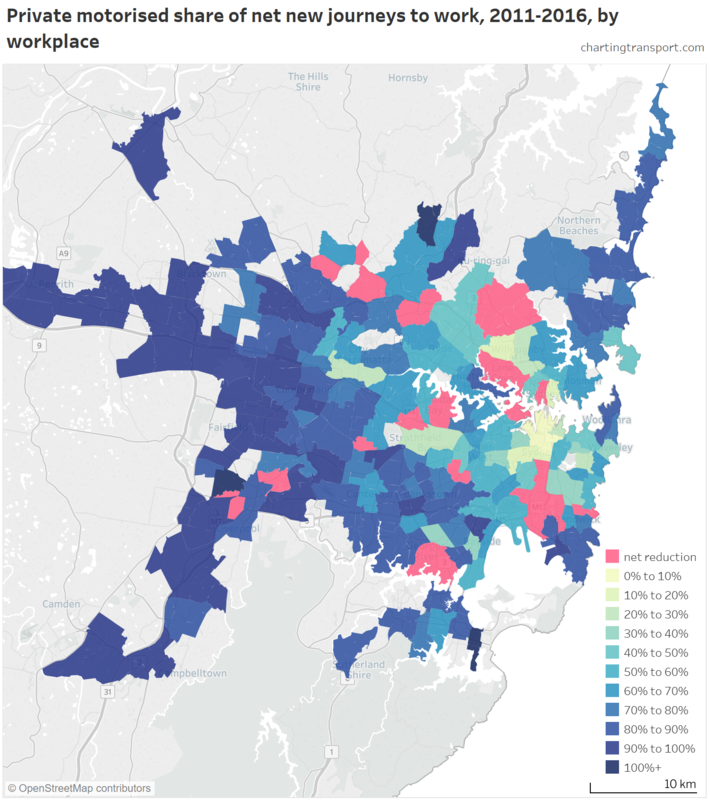 The highest workplace mode shares are in the inner northern suburbs, including Parkville (9%) and Fitzroy North (8%). 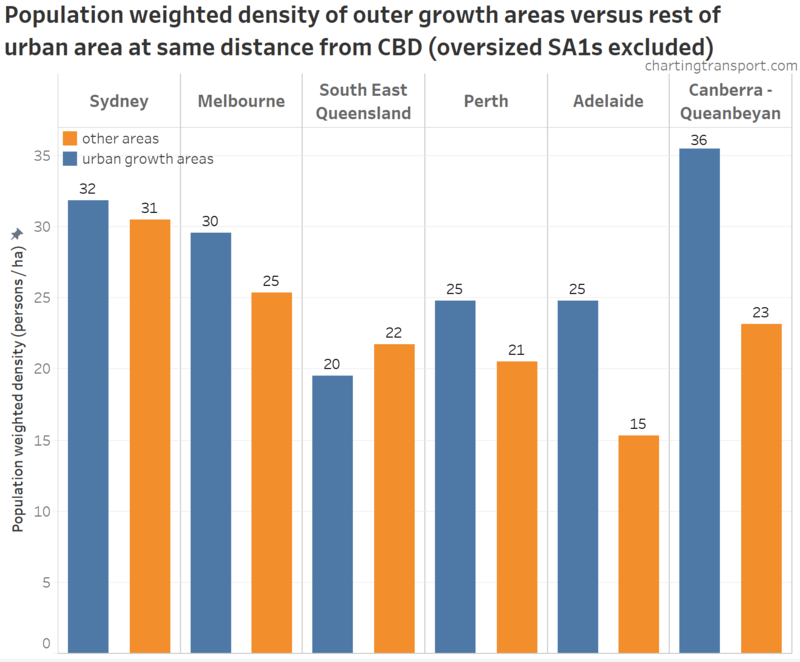 This shows the CBD having the highest concentrations of commuter cycling destinations, although there were also relatively high densities at the Parkville hospitals and the Alfred Hospital. The highest concentration of commuter cyclists in 2016 was a block bound by Lonsdale Street, Exhibition Street, Little Lonsdale Street and Spring Street (it had a mode share of 4.3%). Note: I am using a different scale for charts by workplace distance from the CBD. Overall walking-only mode share in Melbourne as measured by the census has hardly changed, from 3.6% in 2006 to 3.5% in both 2011 and 2016. However there are huge spatial variations. 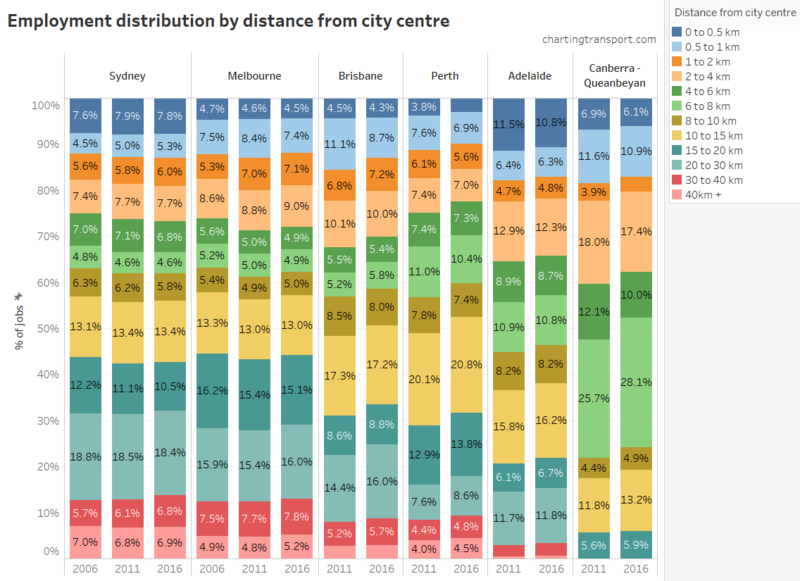 The highest walking mode shares are around the central city with mode shares above 40% in parts of the CBD, Southbank, Carlton, Docklands, North Melbourne, and Parkville. Outside the city centre relatively high mode shares are seen around Monash University Clayton, the Police Academy in Glen Waverley, Box Hill, and Swinburne University in Hawthorn. Walking-only trips are very rare in most other parts of the city. The highest walking shares by SA2 in 2016 were in St Kilda East, Prahran – Windsor, South Yarra, Carlton, Carlton North, Fitzroy, and Elwood. 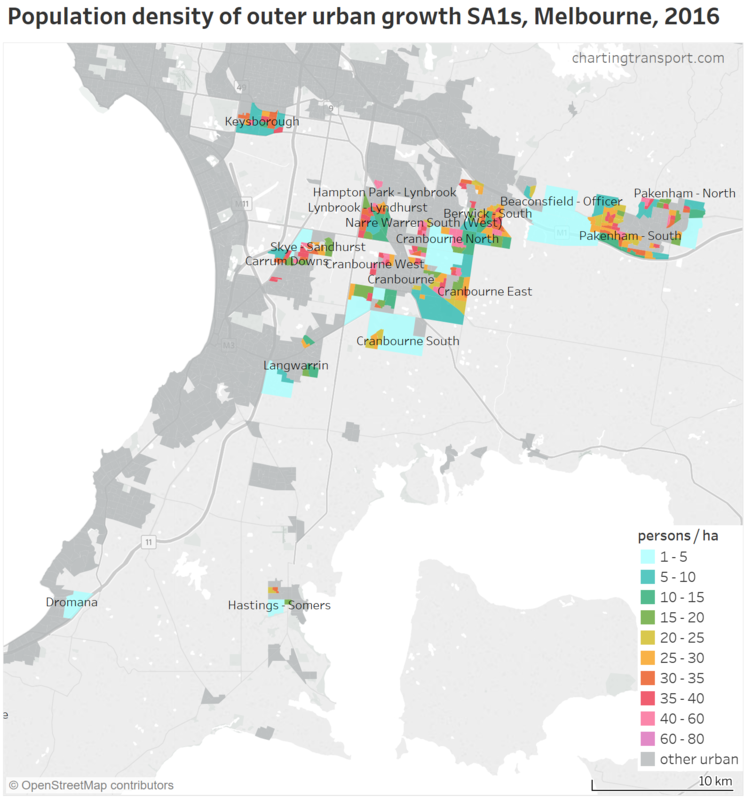 There were also smaller pockets of high walking mode share in Yarraville, Footscray, Flemington, Northcote, Ormond – Glenhuntly, Richmond, and Box Hill. 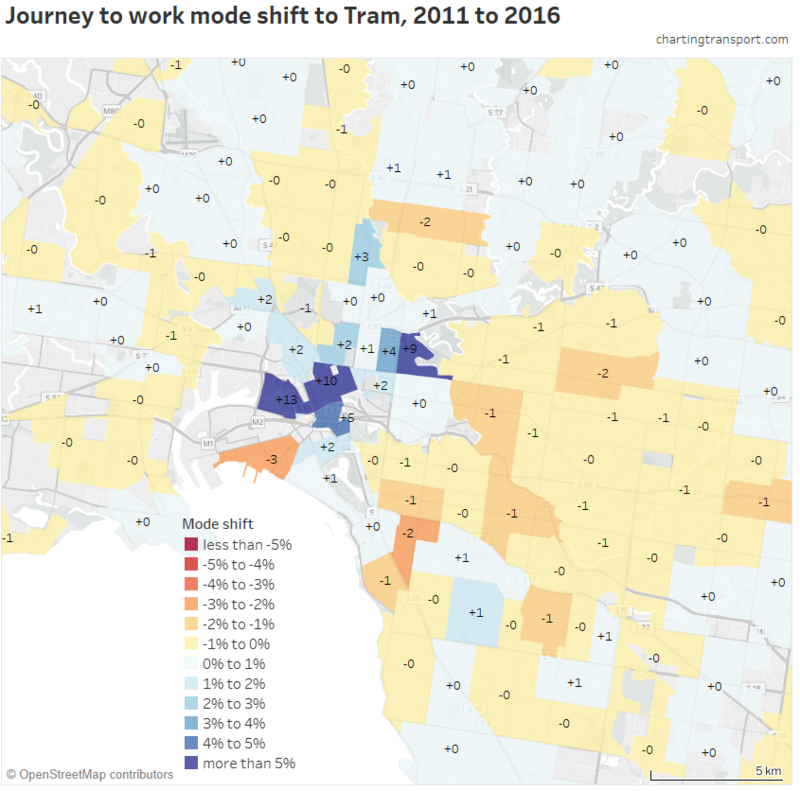 The biggest mode shifts away from walking were in the CBD (-7.3%) and Docklands (-4.0%), which also had big shifts to tram – probably due to the new Free Tram Zone. 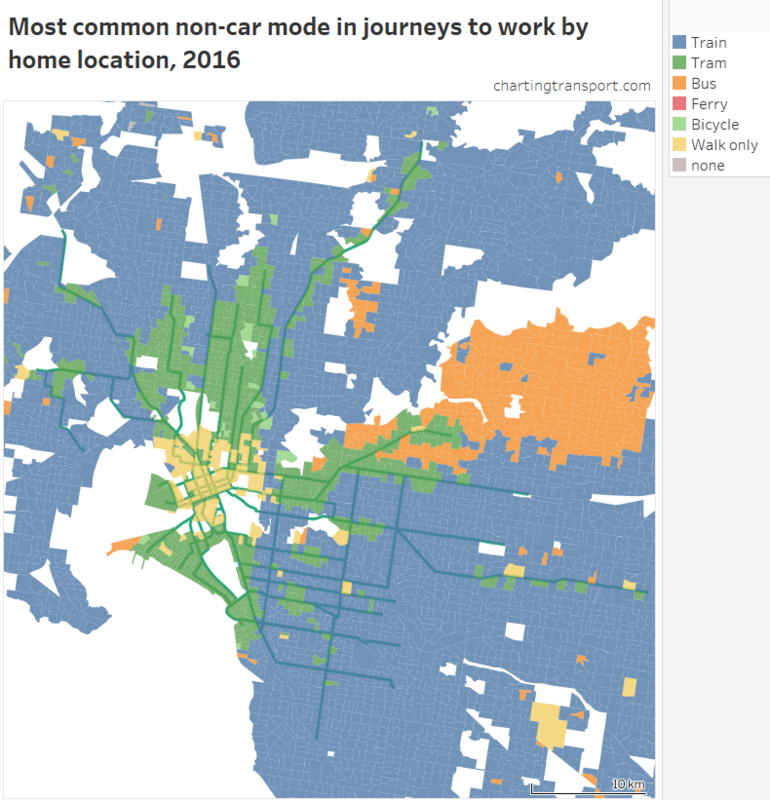 Here is a map showing the most common non-car mode in 2016*. Note the most common non-car mode might still have a very small mode share so interpret this map with caution. *actually, I’ve not checked motorbike/scooter, taxi, or truck on the basis they are very unlikely to be the most common. Train dominates most parts of Melbourne, with notable exceptions of the Manningham region (served by buses but not trains), several tram corridors that are remote from trains, and walking around the city centre. The southern Mornington Peninsula is a mix of bus and walking, plus some SA1s where no one travelled to work by train, tram, bus, ferry, bicycle, or walk-only! Generally tram is only the dominant mode in corridors where trains do no overlap (we saw lower tram mode shares in these areas above). In most of the inner south-eastern suburbs served by trams and trains, train is the dominant non-car mode. If you look carefully, there are a few SA1s where bicycle is the dominant non-car mode. Finally, another way to look at the data is the mode with the highest growth in trips. 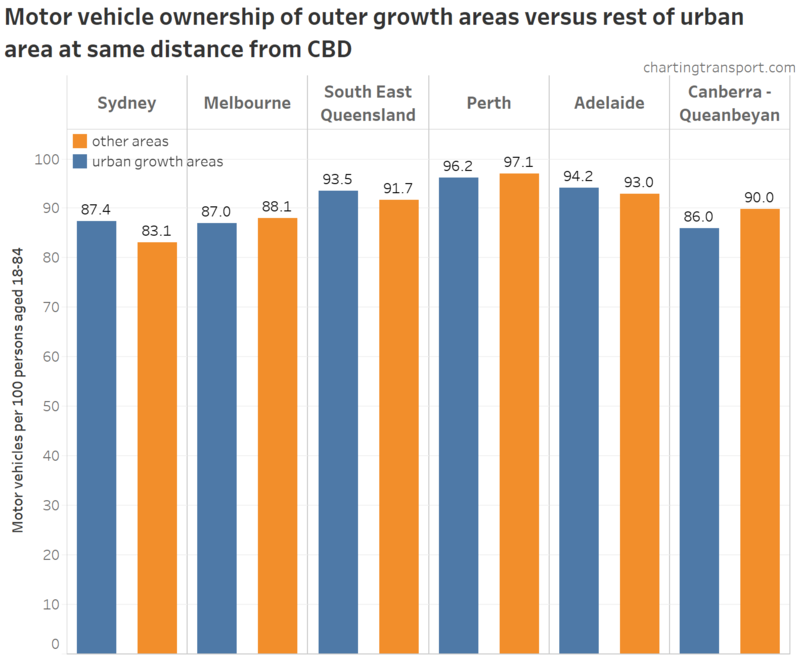 Car trips dominated new trips in most outer suburbs (particularly in the south-east), but certainly not all of Melbourne. Train was most common in many middle suburbs (and even some outer suburbs). 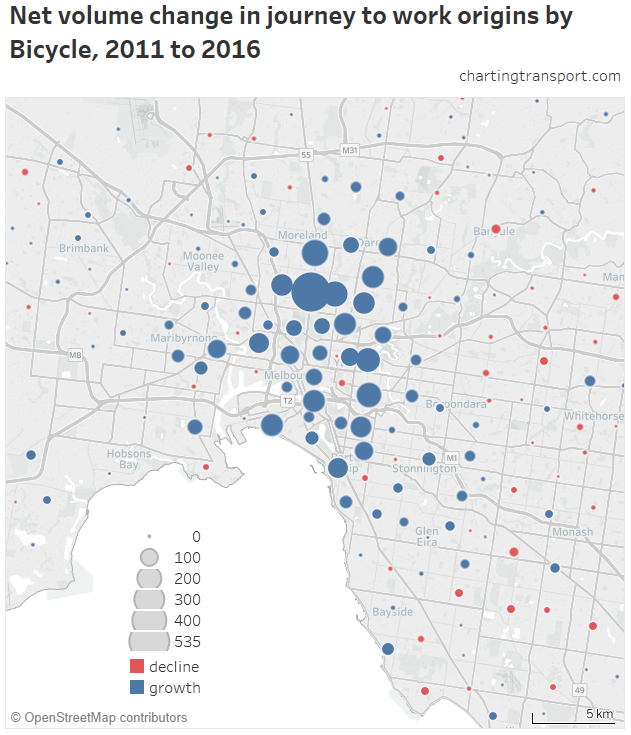 Bicycle was the most common new journey mode in Albert Park (+56 journeys), South Yarra – West (+54), Carlton North – Princes Hill (+80), Fitzroy North (+162) and Brunswick West (+158). Walking led Fitzroy (+147) and Keilor Downs (+15, with most other modes in small decline, so don’t get too excited). Bus topped SA2s in the Doncaster corridor, but also Port Melbourne (+176), Vermont South (+30), Kings Park (+10) and Ormond – Glen Huntly (+275 with rail replacement buses operating on census day in 2016). Tram topped several inner SA2s including the CBD, Docklands and Southbank. A caution on this map: the contest might have been very close between modes and the map doesn’t tell you how close. Want to explore the data in Tableau? I’ve built visualisations in Tableau Public where you can choose your mode of interest, year(s) of interest, and zoom into whatever geography you like. Have fun exploring the data! This post was updated on 24 March 2018 with improved maps. Also, data reported at SA2 level is now as extracted at SA2 level for 2011 and 2016, rather than an aggregation of CD/SA1/DZ data (each of which has small random adjustment for privacy reasons, which amplifies when you aggregate, also some work destinations seem to be coded to an SA2 but not a specific DZ). This does have a small impact, particularly for mode shifts, and mode with the most growth. This post was further updated on 11 May 2018 to include minor adjustments to DZ workplace counts in 2011 to account for jobs where the SA2 was known but the DZ was not, and to improve mapping from 2011 DZs to 2016 SA2s. 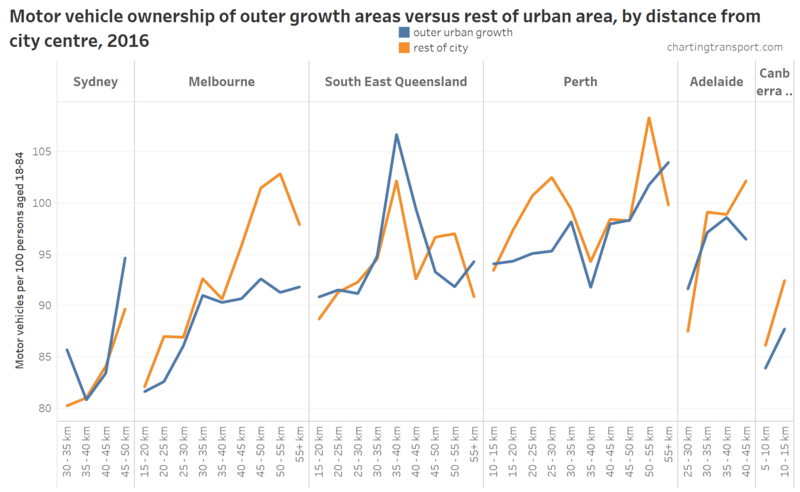 Refer to the appendix in the Brisbane post for all the details about the data. Post last updated 11 May 2018. See end of post for details. While journeys to work only represents around a quarter of all trips in Melbourne, they represent around 39% of trips in the AM peak (source: VISTA 2012-13). 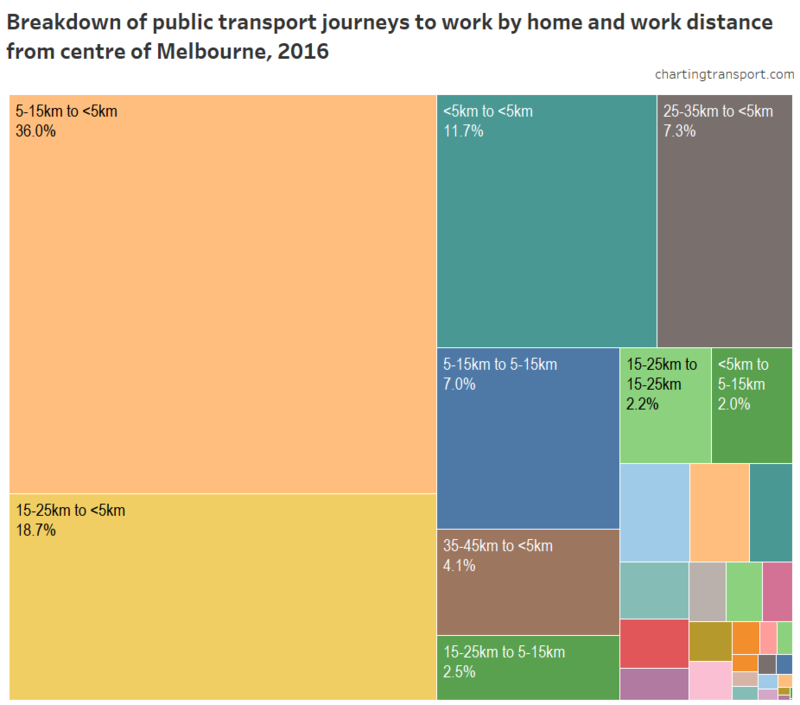 Thanks to the census there is incredibly detailed data available about the journey to work, and who doesn’t like exploring transport data in detail? This post unpacks where mode shifts and trip growth is happening, by home locations, work locations, and home-work pairs. It tries to summarise the spatial distribution of journeys to work in Melbourne. 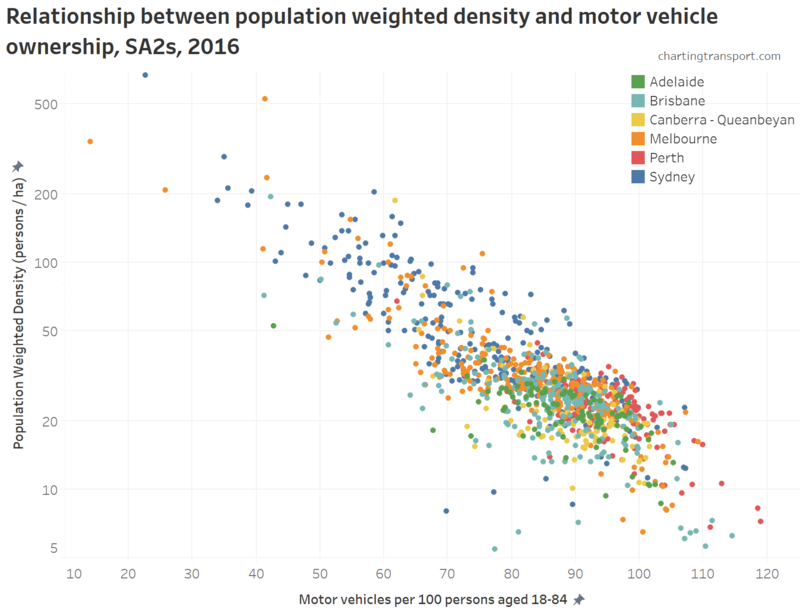 It will also look at the relationship between car parking, job density and mode shares. I’m afraid this isn’t a short post. 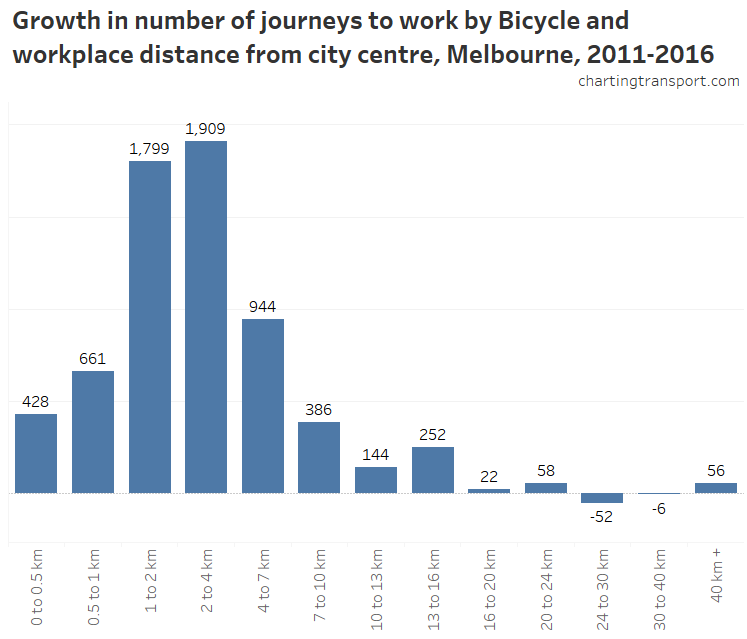 So get comfortable, there is much fascinating data to explore about commuting in Melbourne. 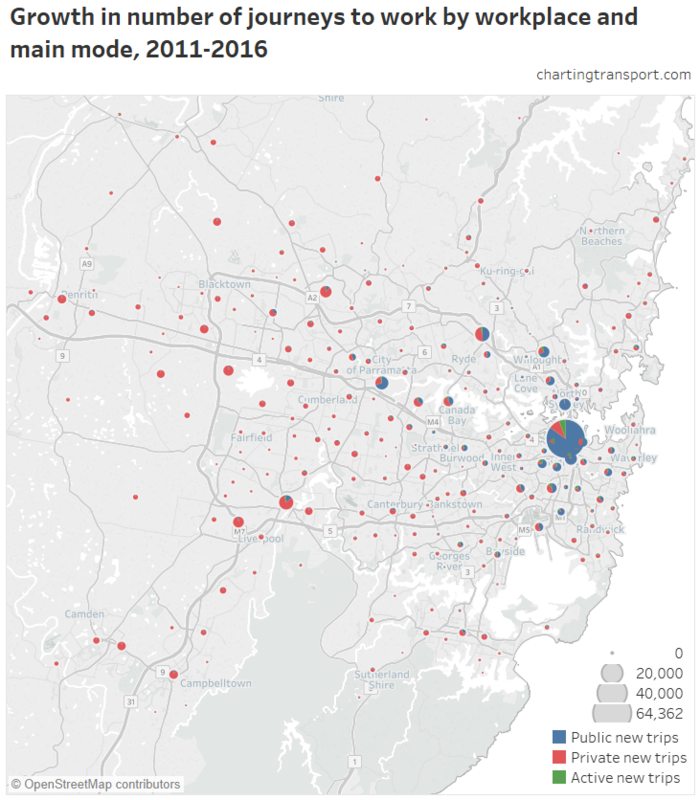 Here’s an animated public transport mode share map 2006 to 2016 – you might want to click to enlarge, or view this map in Tableau (be patient it can take some time to load and refresh). For those with some colour-blindness, you can also get colour-blind friendly colour scales in Tableau. The higher mode shares pretty clearly follow the train lines and the areas covered by trams, with mode share growing around these lines. 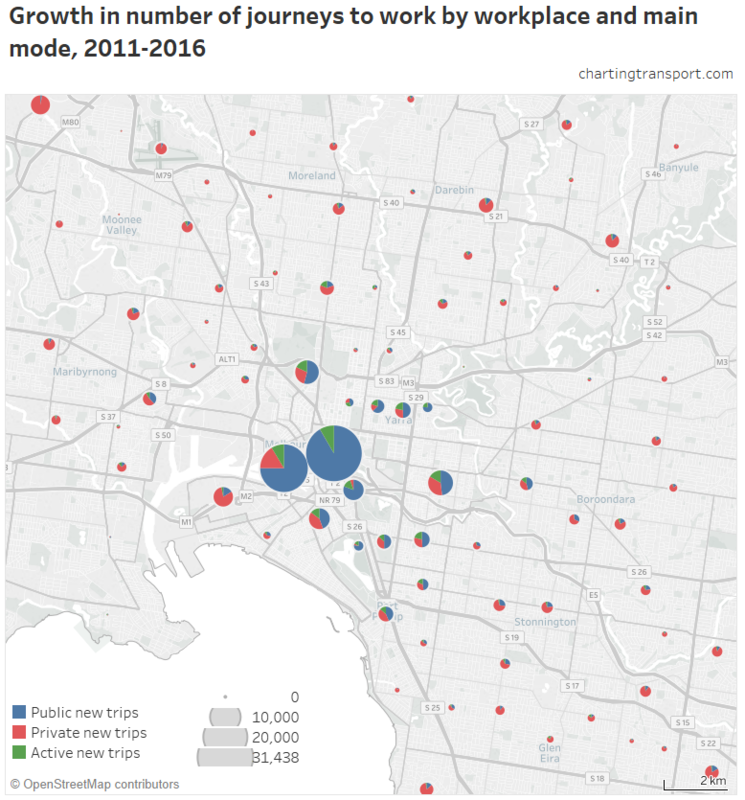 Public transport mode shares of over 50% can be found in a sizeable patch of Footscray, and pockets of West Footscray, Glenroy, Ormond – Glen Huntly, Murrumbeena, Flemington, Docklands, Carlton, and South Yarra. Larger urban areas with very low public transport mode share can be found around the outer east and south-east of the city, particularly those remote from the rail network. 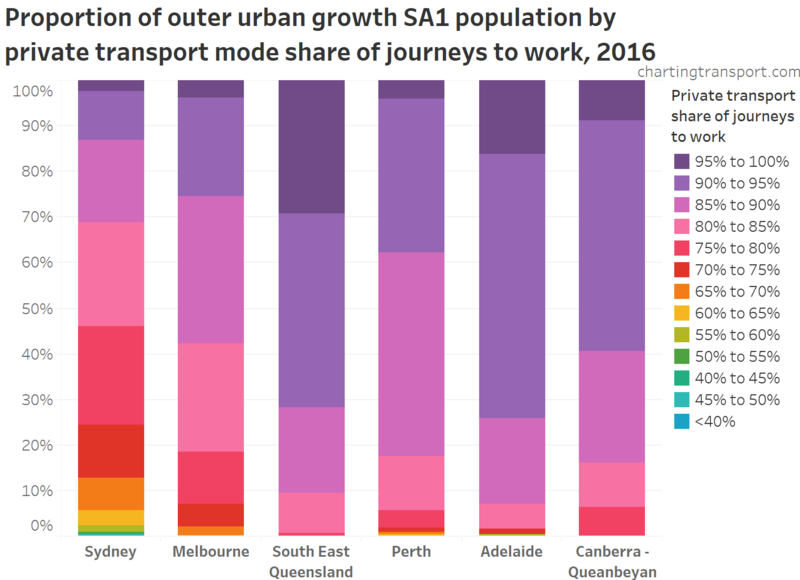 The biggest shifts to public transport in the middle and outer suburbs were in Wyndham Vale, Tarneit, South Morang, Lynbrook/Lyndhurst, Sanctuary Lakes (Point Cook – East), Truganina / Williams Landing, Rockbank, Pascoe Vale, and Glenroy. That’s almost a roll call of all the new train stations opened between 2011 and 2016. The exceptions are Rockbank (a small community at present which received significantly more frequent trains in 2015), Point Cook East (a bus service was introduced in 2015), and Pascoe Vale / Glenroy (where more people are commuting to the city centre and increasingly by public transport). Inner suburban areas with high mode shifts include West Footscray, Yarraville, Seddon – Kingsville, Collingwood, Abbotsford, Kensington, Flemington, South Yarra – East, and Brighton. 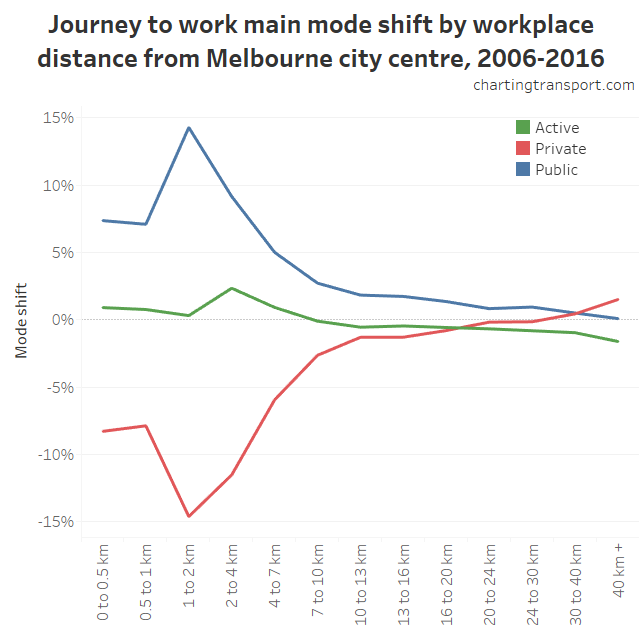 The Melbourne CBD itself had a 13% shift to public transport – and actually a 6% mode shift away from walking (which probably reflects the new Free Tram Zone in the CBD area). 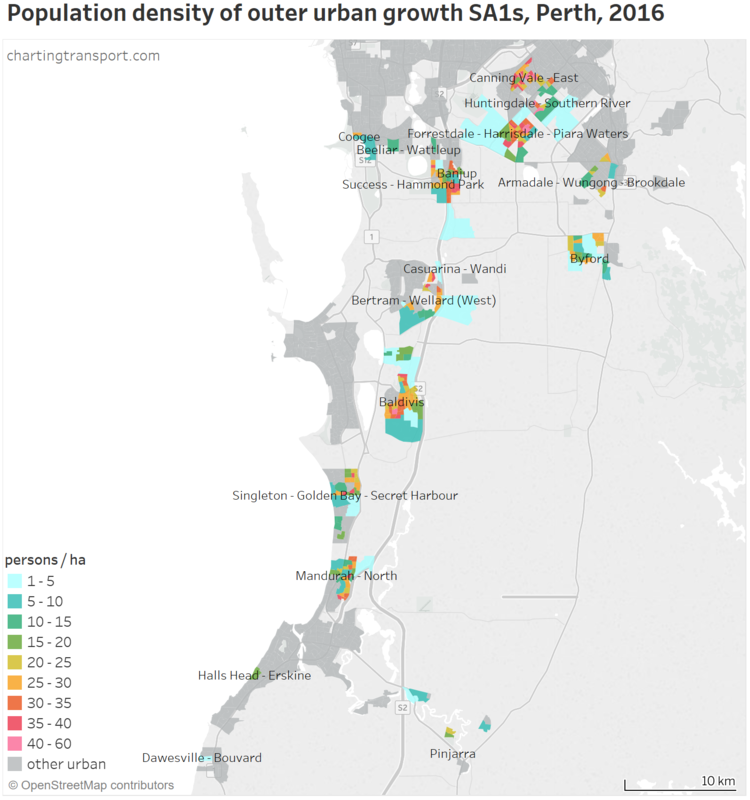 The biggest mode shifts away from public transport (of 1 to 2%) were at Ardeer – Albion, Coburg North, Chelsea – Bonbeach, Seaford, Frankston, Dandenong, Hampton Park – Lynbrook, and Lysterfield. At the 2016 census there were no express trains operating on the Frankston railway line due to level crossing removal works, which might have slightly impacted public transport demand in Frankston, Seaford and Chelsea – Bonbeach. I’m not sure of explanations for the others, but these were not large mode shifts. 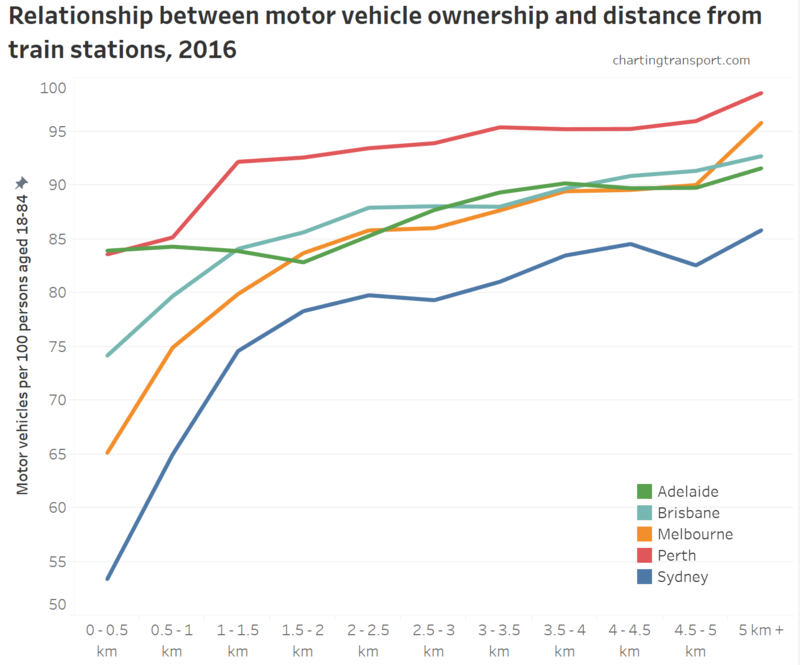 It’s no surprise that public transport mode share is highest in the CBD and surrounding area, and lower in the suburbs. 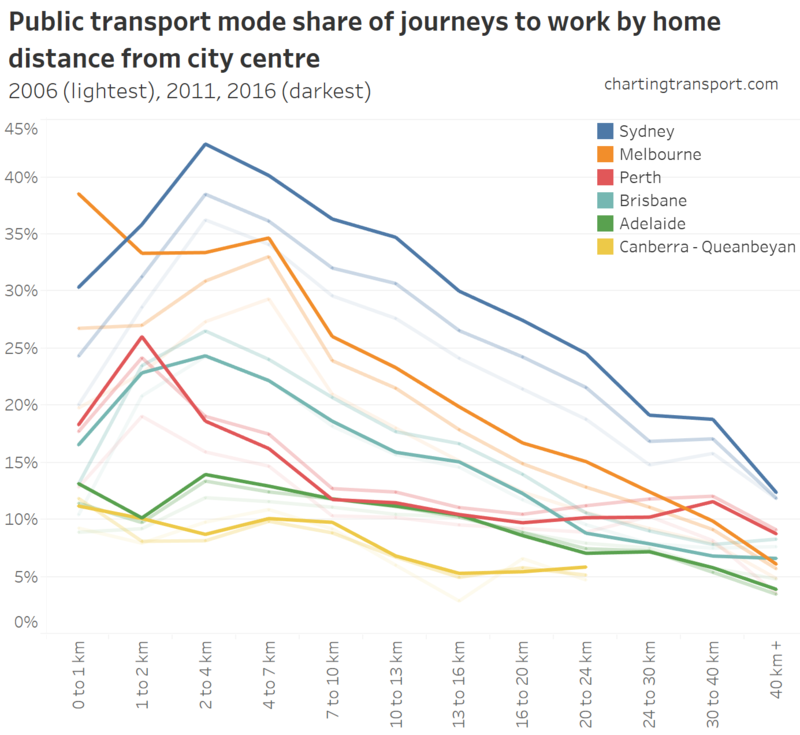 But note the scale – public transport mode share falls away extremely quickly as you move away from the city centre. 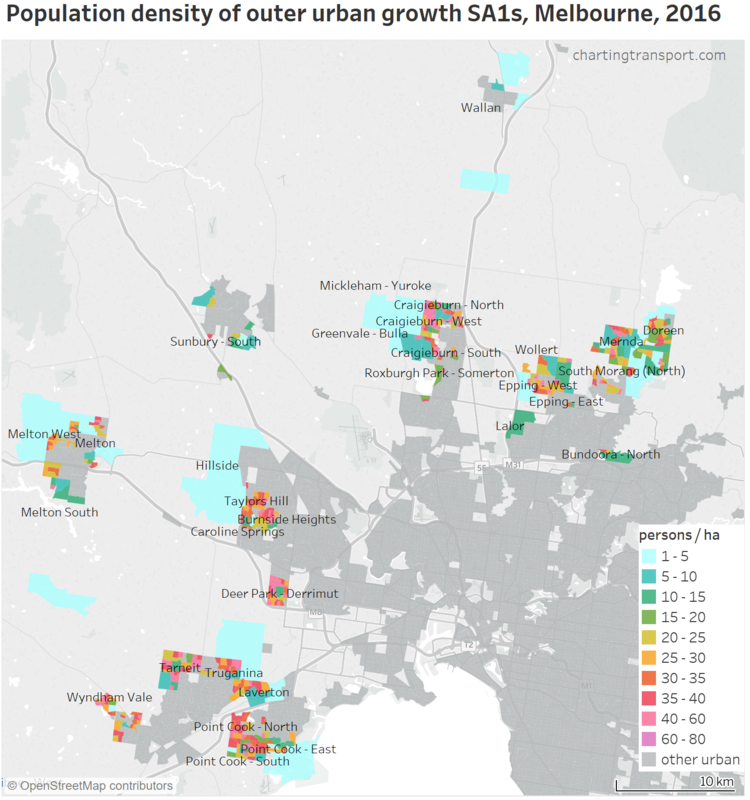 Large areas of Melbourne have near saturation private transport mode share. In most suburban areas employee parking is likely to be free and public transport would struggle to compete with car travel times, even on congested roads (particularly for buses that are also on those congested roads). 17% at the Monash University Clayton campus. Explore the data yourself in Tableau. 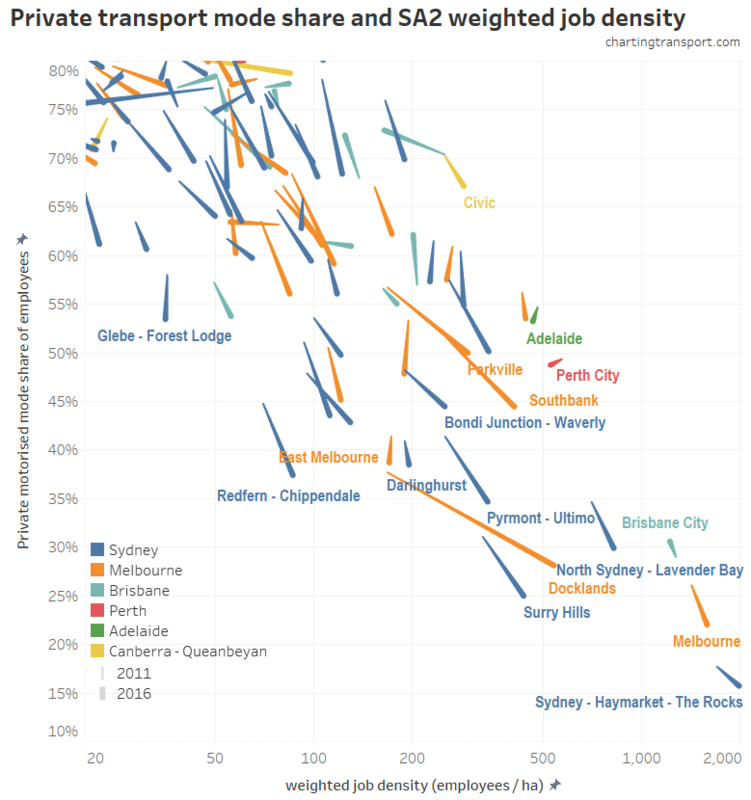 The biggest shifts to public transport were in the inner city. The biggest shifts away from public transport were 1.4% in Ormond – Glen Huntly (rail stations temporarily closed) and North Melbourne. 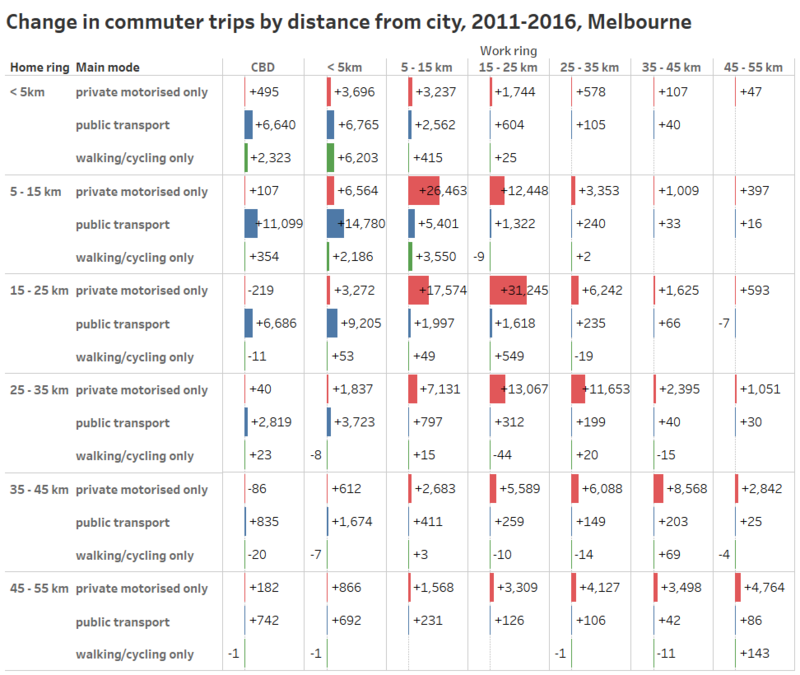 Docklands had the highest mode shift to public transport of 9% (almost all of it involving train) followed by Collingwood with 7%, and Parkville, Southbank, and Abbotsford with 6%. North Melbourne saw a decline of 1.4% – at the same time private transport mode share and active (only) mode shares increased by 1%. The biggest mode shift from private to public transport was for distances of 1-2km from the city centre, which includes Docklands, East Melbourne, most of Southbank, and southern Carlton and Parkville (see here for a reference map). 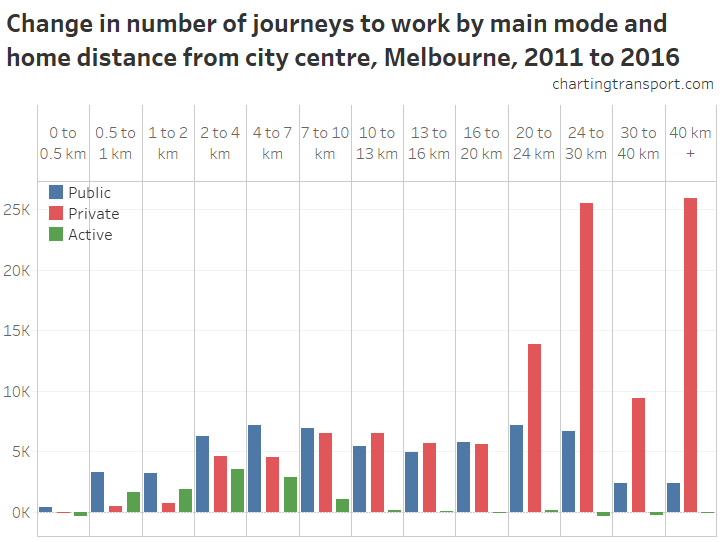 A mode shift to public transport (on average) was seen for workplaces up to 40km from the city centre. 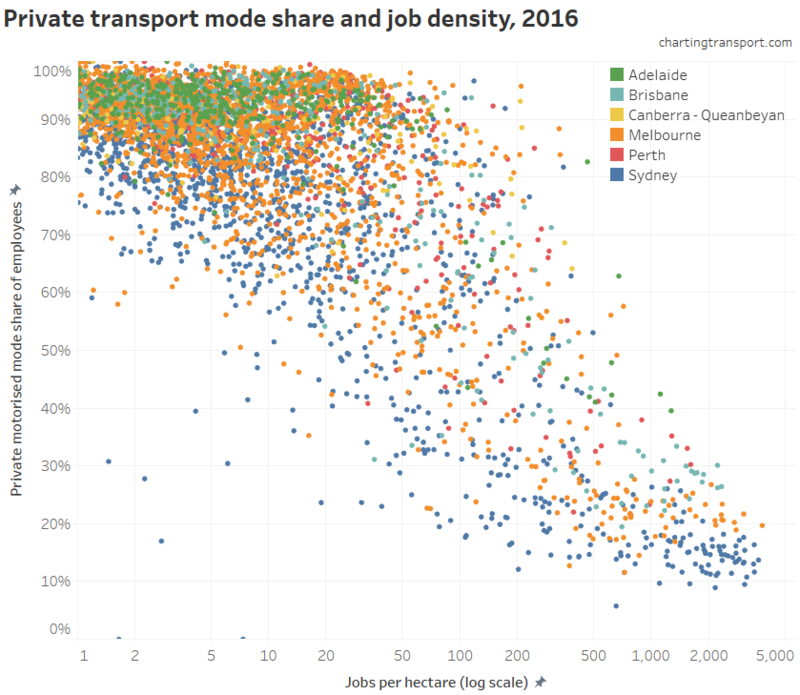 The biggest mode shift to active transport was for jobs 2-4 km from the city centre (but do keep in mind that weather can impact active transport mode shares on census day). Up until now I’ve been looking at mode shifts by geography – but the zones can have very different numbers of commuters. What matters more is the overall change in volumes for different modes. A big mode shift for a small number of journeys can be a smaller trip count than a small mode shift on a large number of journeys. a pocket of Richmond containing the Epworth Hospital (39.5% PT mode share). Explore this map in Tableau. 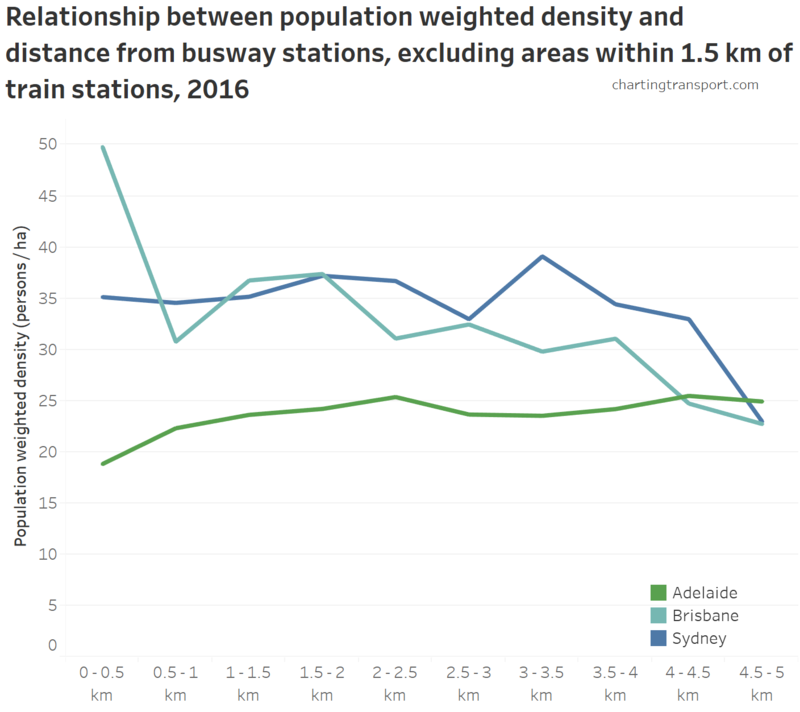 Correlation of course is not necessarily causation – high job density doesn’t automatically trigger improved public and active transport options. 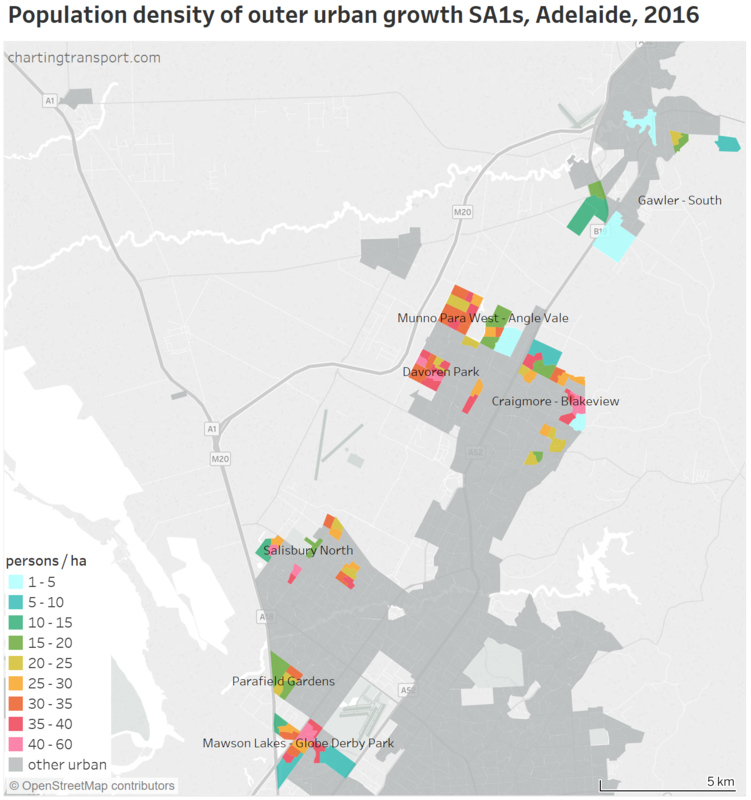 But parking is likely to be more expensive and/or less plentiful in areas with high employment density, and many employers will be attracted to locations with good public transport access so they can tap into larger labour pools. 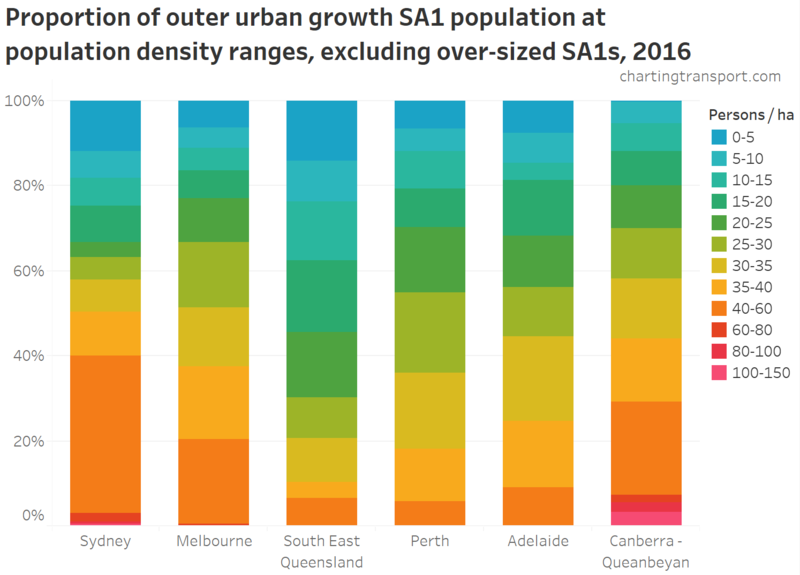 The Melbourne CBD SA2 is at the bottom right corner of the chart, if you were wondering. The Port Melbourne Industrial and Clayton SA2s are relatively high density employment areas with around 90% private transport mode shares. 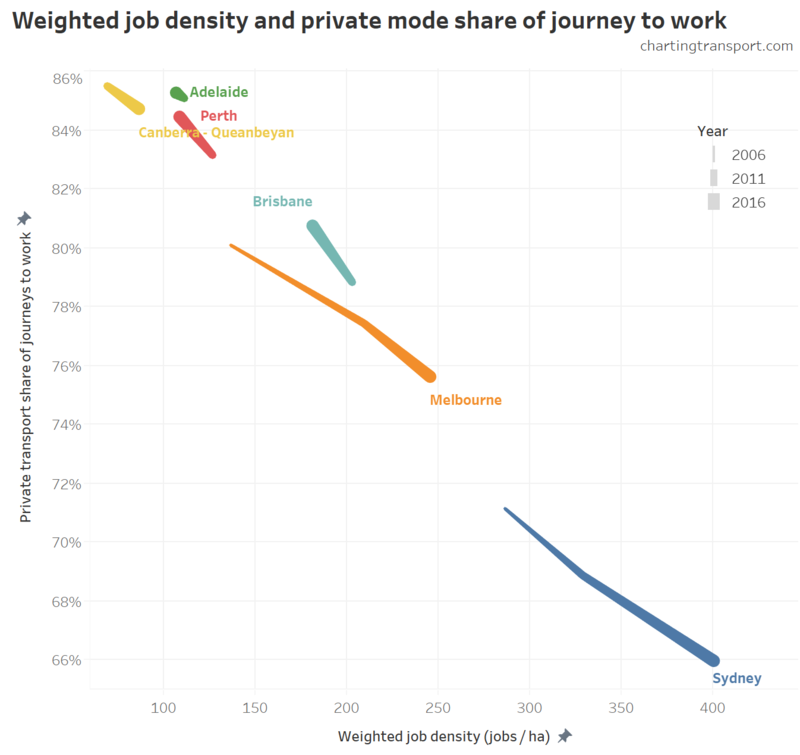 Not only is there a strong (negative) relationship between job density and private transport mode share, most of these SA2s are moving down and to the right on the chart (with the exception of North Melbourne which saw only small change between 2011 and 2016). 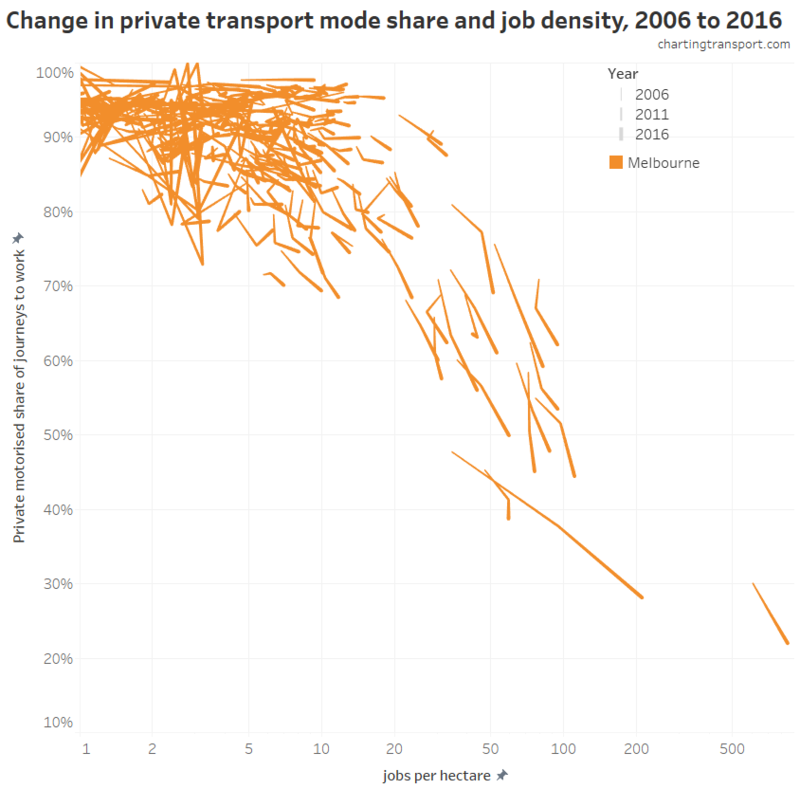 However the correlation probably reflects many new jobs being created in areas with good public and active transport access, particularly as Melbourne grows its knowledge economy and employers want access to a wide labour market. How does private transport mode share relate to car parking provision? Do more people drive to work if parking is more plentiful where they work? 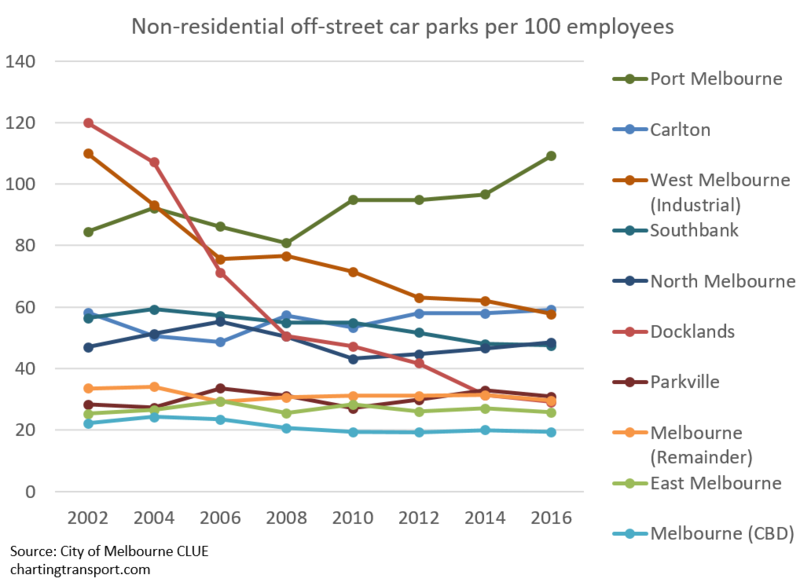 Car parking provision per employee has increased in Carlton, North Melbourne and Port Melbourne and decreased in Docklands, West Melbourne (industrial), and Southbank. Docklands had the highest car parking provision in 2002 but this has fallen dramatically and land has been developed for employment usage. 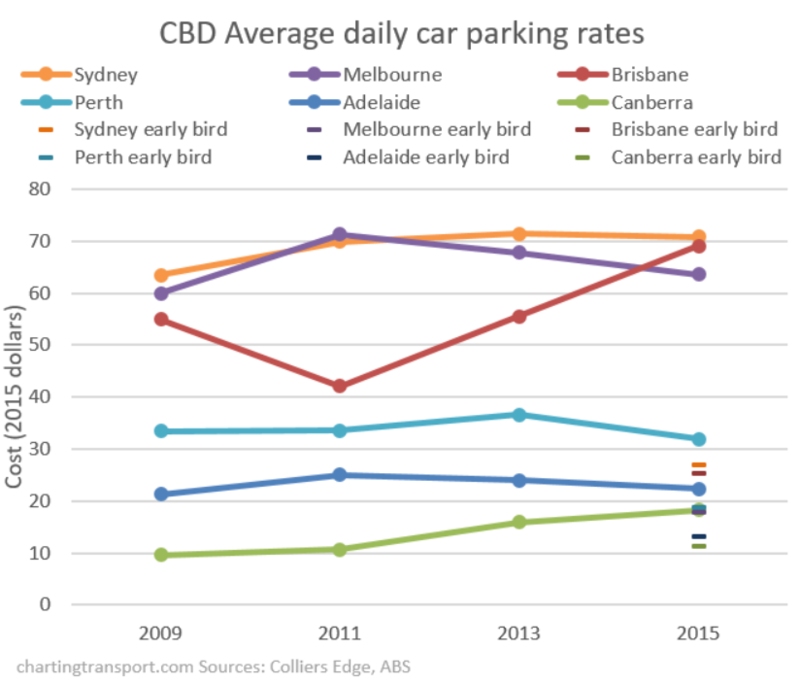 Southbank, which borders the CBD, has relatively high car park provisioning – much higher than Docklands and East Melbourne. 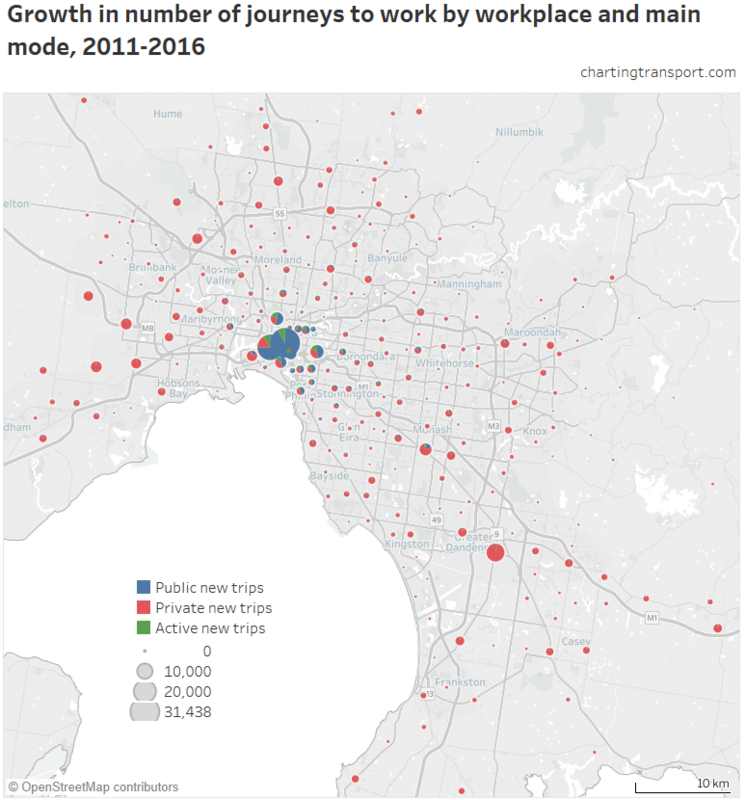 It’s little surprise to see a strong relationship between the two, although Carlton is seeing increasing parking provision but decreasing private transport mode share (maybe those car parks aren’t priced for commuters?). 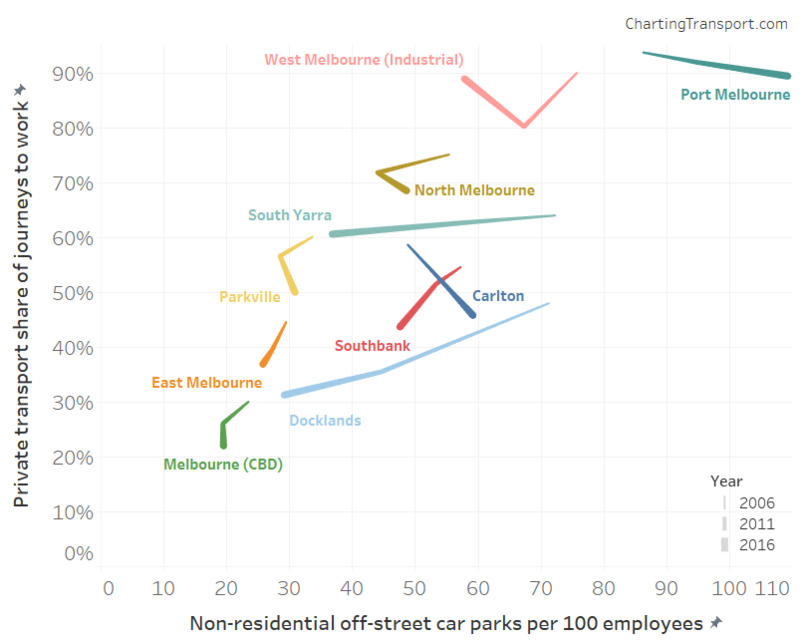 If all non-resident off street car parks were used by commuters, then you would expect the private transport mode share to be the same as the car parks per employee ratio. 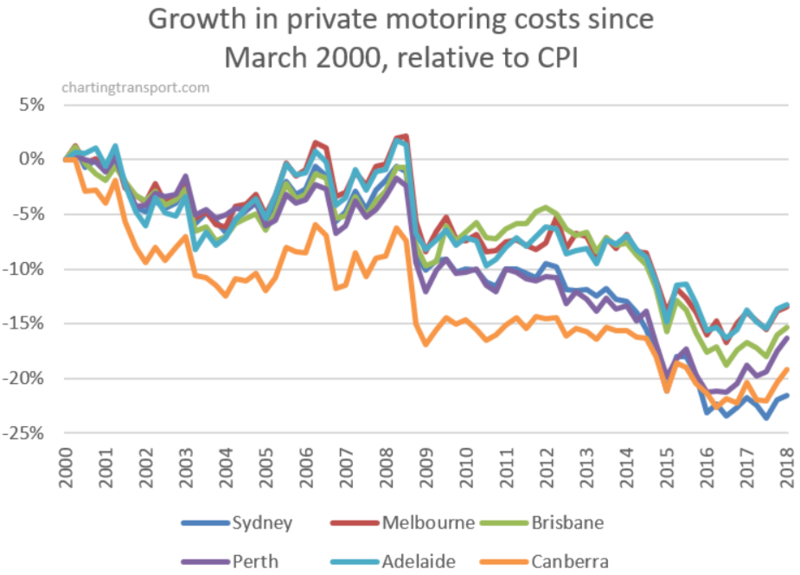 Private transport mode shares were much the same as parking provision rates in Melbourne CBD, Docklands, and Southbank, suggesting most non-residential car parks are being used by commuters (with the market finding the right price to fill the car parks?). 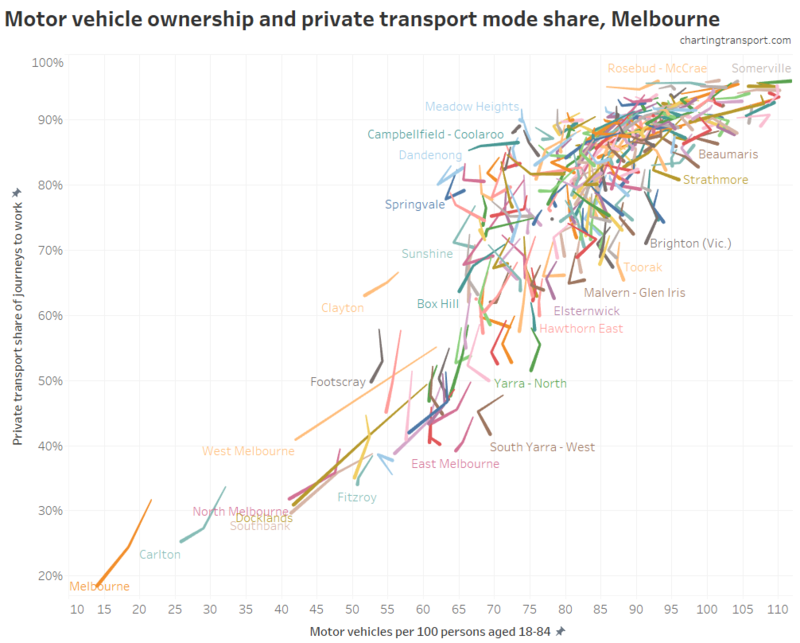 Private transport mode share was higher than car parking provision in East Melbourne, Parkville, South Yarra, North Melbourne, and West Melbourne (industrial). This might be to do with on-street parking and/or more re-use of car parks by shift workers (eg hospital workers). Port Melbourne parking provision is very high (there is also lots of on-street parking). It’s possible some people park in Port Melbourne and walk across Lorimer Street (the CLUE border) to work in “Docklands” (which includes a significant area just north of Lorimer Street). It’s also likely that many parking spaces are reserved for visitors to businesses. 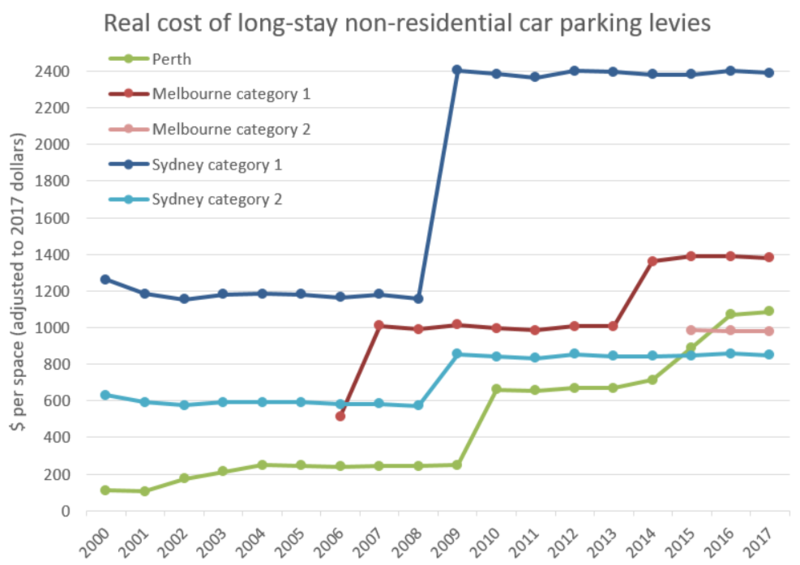 Carlton similarly had higher parking provision than private transport mode share (again, could be priced for visitors). Where are the new jobs and how did people get to them? The biggest growth in jobs was in the CBD (+31,438), followed by Docklands (+22,993), Dandenong (+11,136), and then Richmond (+6,242). 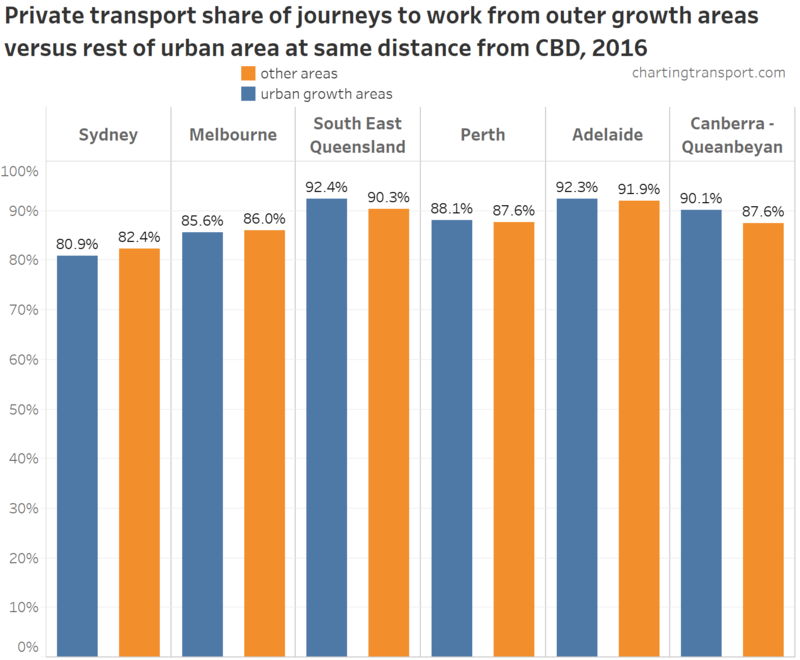 The CBD added 31,438 jobs, and almost all of those were accounted for by public transport journeys, although 2,630 were by active transport, and only 449 new jobs by private transport (1%). 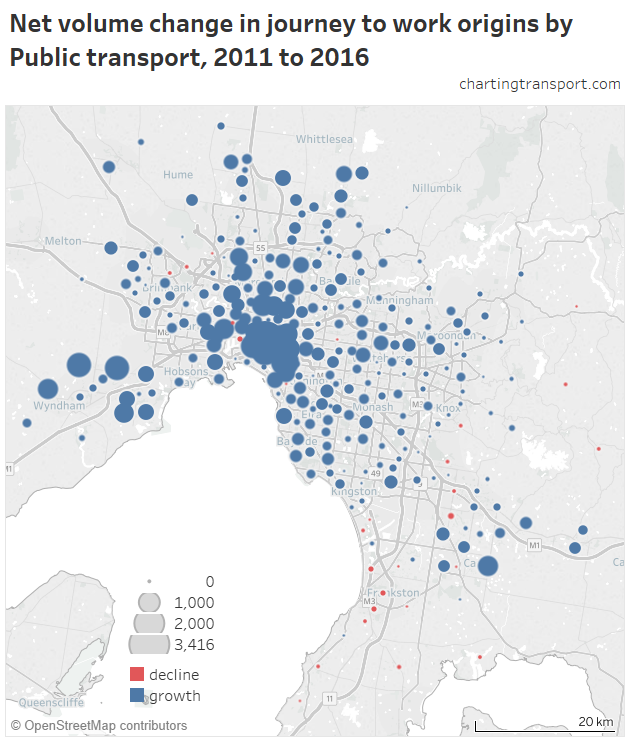 Likewise most of the growth in Docklands and Southbank was by public transport, and then in several inner suburbs private transport was a minority a new trips. 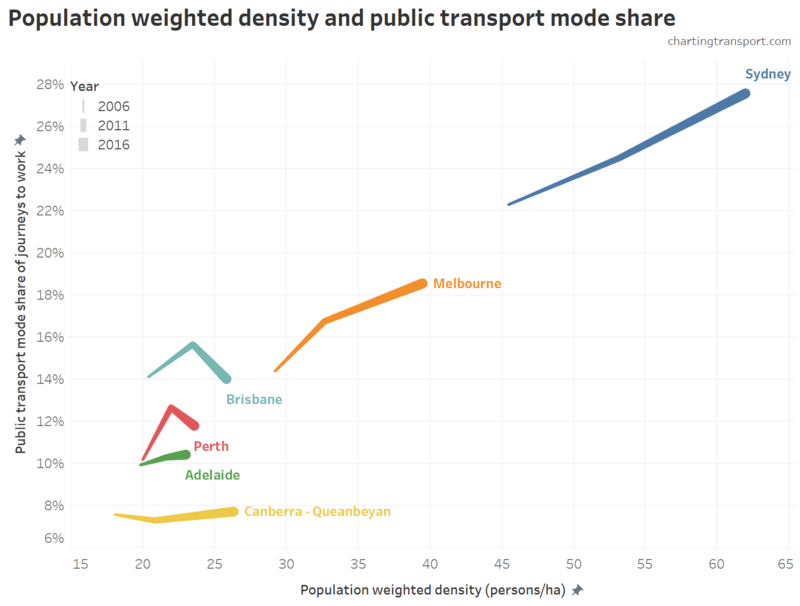 However, Southbank still has a relatively high private transport mode share of 46% for an area so close to the CBD. The earlier car parking chart showed that Southbank has about one off-street non-residential car park for every two employees. These include over 5000 car parks at the Crown complex alone (with $16 all day commuter parking available as at November 2017). It stands to reason that the high car parking provision could significantly contribute to the relatively high private transport mode share, which is in turn generating large volumes of radial car traffic to the city centre on congested roads. Planning authorities might want to consider this when reviewing applications for new non-residential car parks in Southbank. 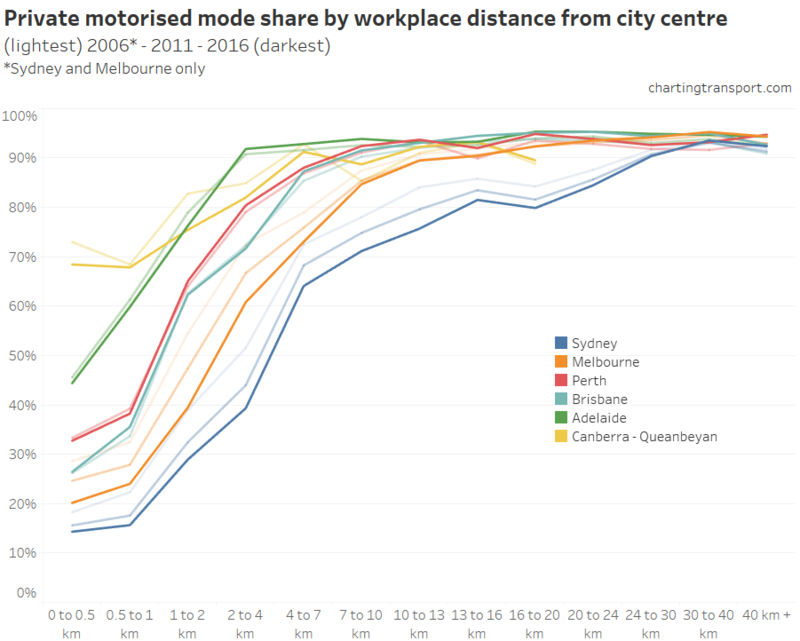 Here’s a chart look looking at commuter volumes changes by workplace distance from the CBD (see here for a map of the bands). Public transport dominated new journeys to work up to 4km from the city centre. 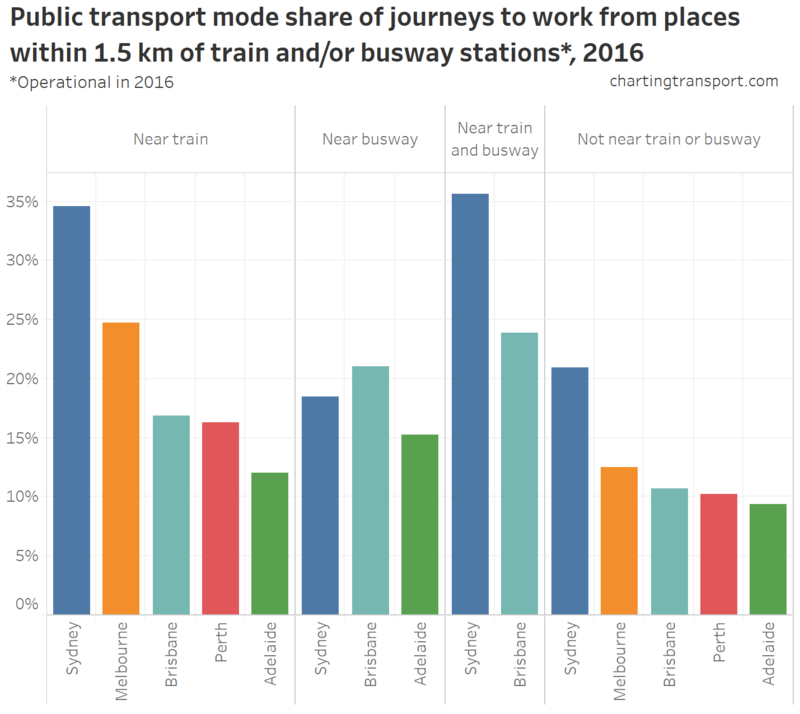 Private transport dominated new journeys to workplaces more than 4km from the city centre – however that doesn’t necessarily mean a mode shift away from public transport if the new trips have a higher public transport mode share than the 2011 trips. 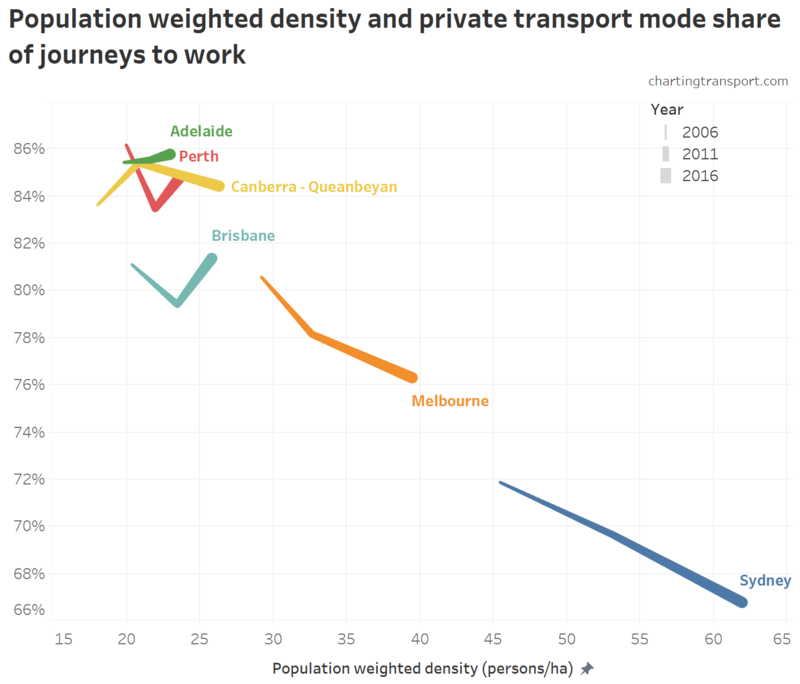 Indeed there was a mode shift towards public transport for workplaces in most parts of Melbourne. Private transport had the lowest mode share of new jobs in the inner city. As seen on the map, some relative anomalies for their distance from the CBD include Box Hill (64%), Hampton (57%), Brunswick East (34%), Dingley Village (28%), and Albert Park (6%). Explore the data in Tableau. Where did the new commuters come from and what mode did they use? 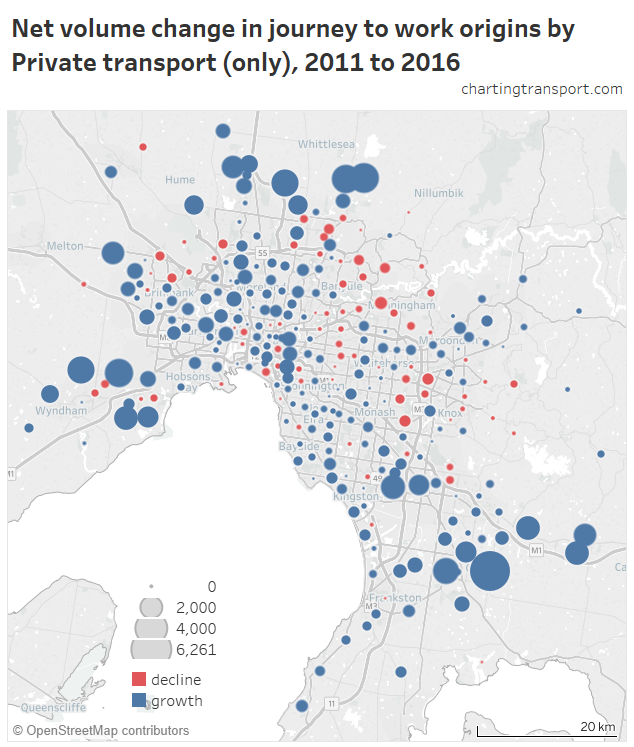 As you can see many of the new private transport journeys to work commenced in the growth areas, although there were also some substantial numbers from inner suburbs such as South Yarra, Richmond, Braybrook, Maribyrnong and Abbotsford. There are many middle suburban SA2s with declines. 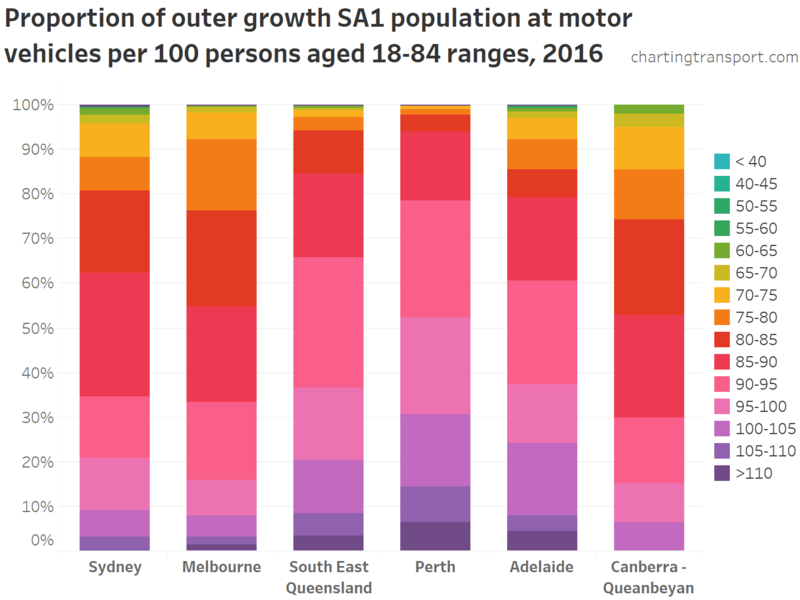 These are also suburbs where there has been population decline – which I suspect are seeing empty nesting (adult children moving out) and people retiring from work. For example Templestowe generated 566 fewer private transport trips, 28 fewer active transport only trips, but only 70 new public transport trips. The biggest increases were from the inner city, with the CBD itself generating the largest number of new public transport trips (including almost 2500 journeys involving tram). However there were a number of new public transport trips from the Wyndham area in the south-west (where new train stations opened). You can see many areas where private transport accounted for a minority of new trips. Also, around half of new trips in several middle northern suburbs were by public transport. 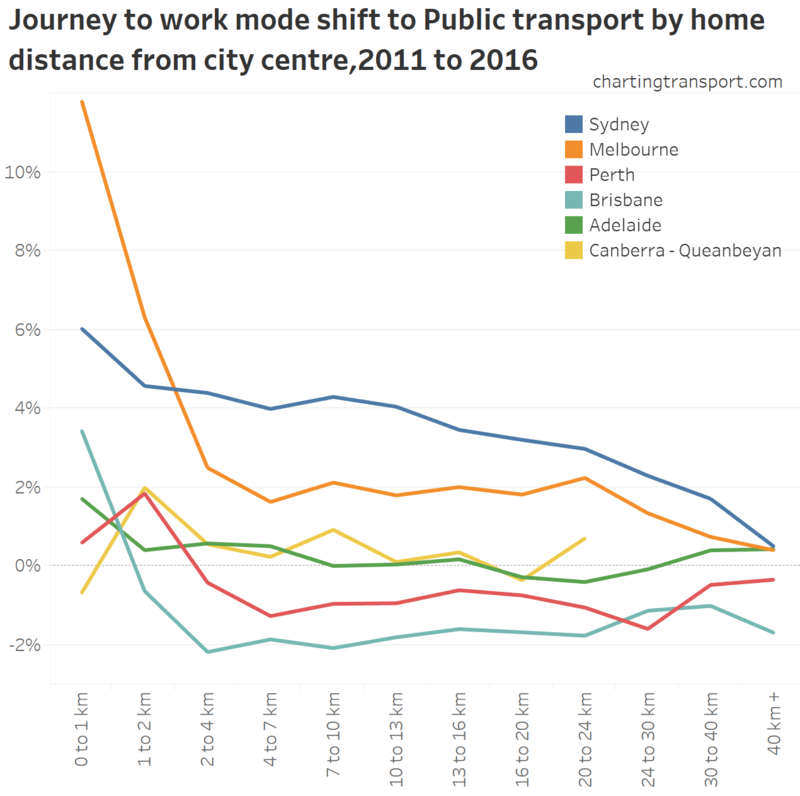 Public transport dominated new journeys to work for home locations up until 10km from the city centre, was roughly even with private transport from 10km to 20km (hence a net mode shift to public transport). 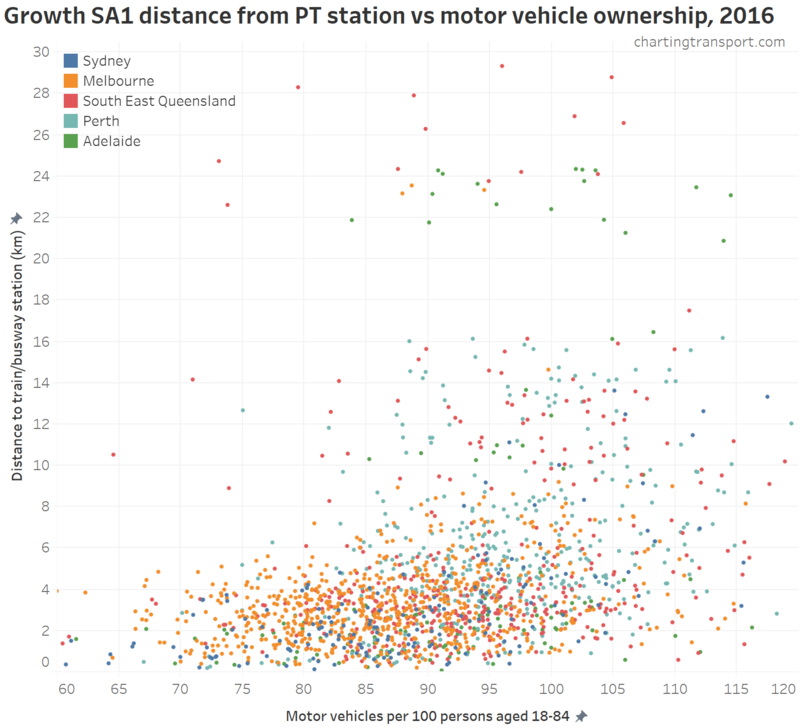 However private transport dominated new commuter journeys beyond 20km – most of which is from urban growth areas. The 24-30 km band covers most of the western and northern growth areas, while the 40km+ band is almost entirely the south-east growth areas. The pink areas had a net decline in the number of private transport trips (or total trips) generated, so calculating a mode share doesn’t make a lot of sense. There are some areas with 100%+ which means more new private transport trips were generated than total new trips – ie active and/or public transport trips declined. Wyndham in the south-west where two new train stations opened. 41% of new trips from Wyndham Vale and 30% of new trips from Tarneit were by public transport. Sunbury in the north-west, to which the Metro train network was extended in 2012. Around 37% of new trips from Sunbury -South were by public transport (that’s 307 trips). 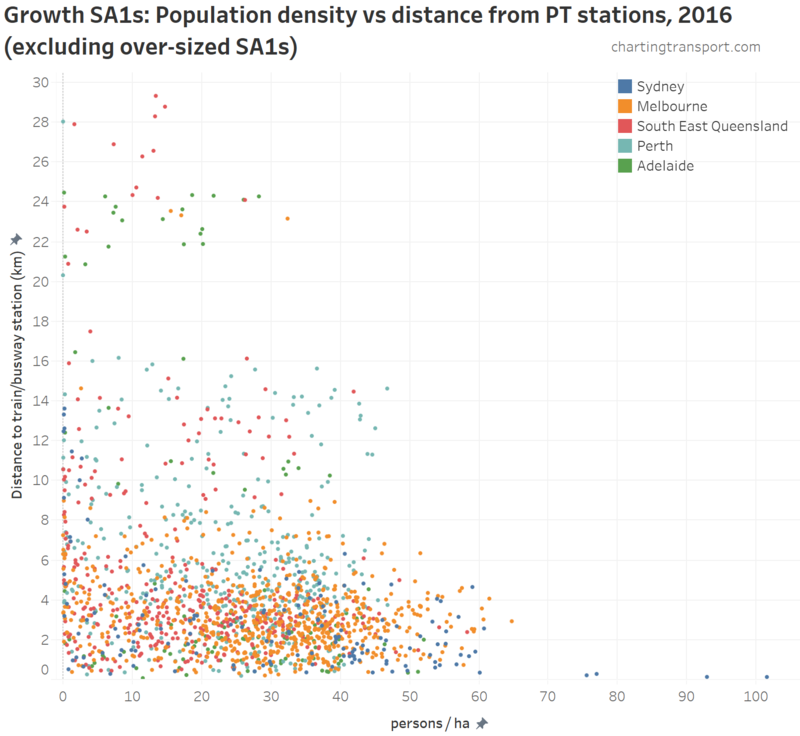 How has the distribution of home and work locations in Melbourne changed by distance from the city? 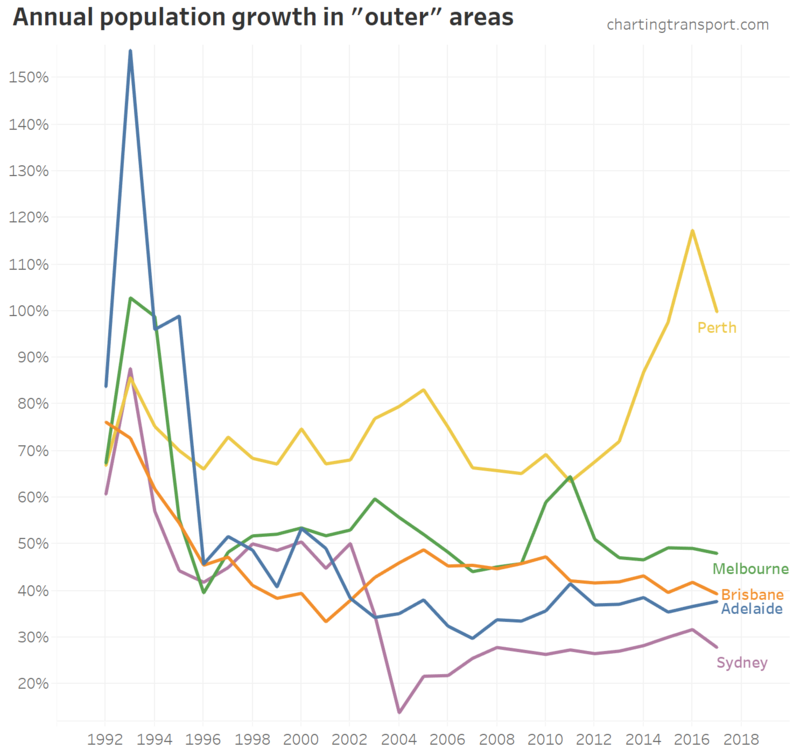 You can see most of the worker population growth (origins) has been in the outer suburbs. The destination (job) growth was much more concentrated in the inner city between 2006 and 2011, but then more evenly distributed across the city in 2016. 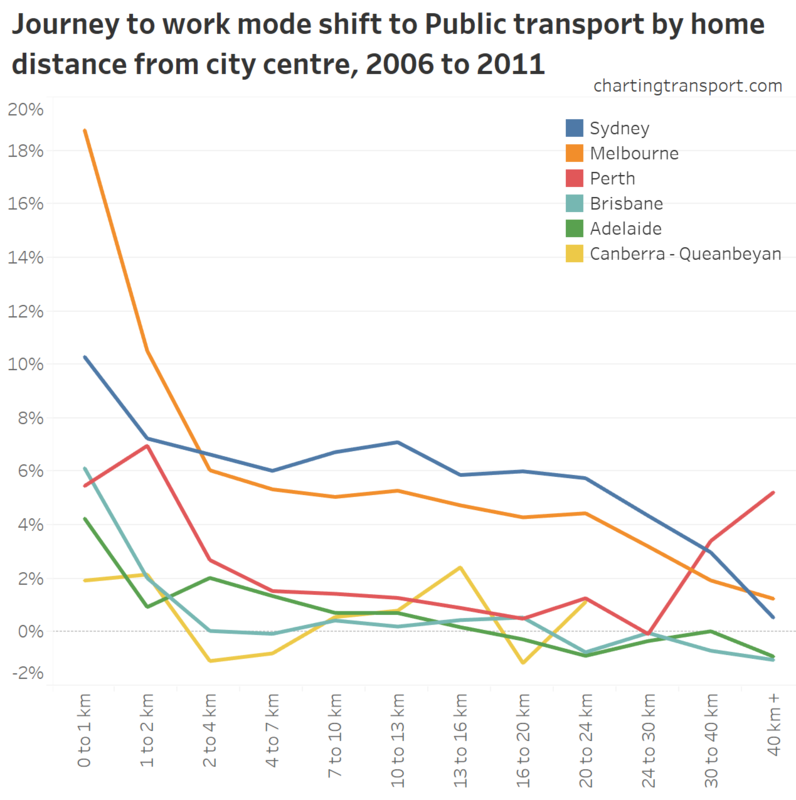 The median distance of commuter home locations from the city centre increased from 18.2 km in 2006 to 18.6 km in 2016. 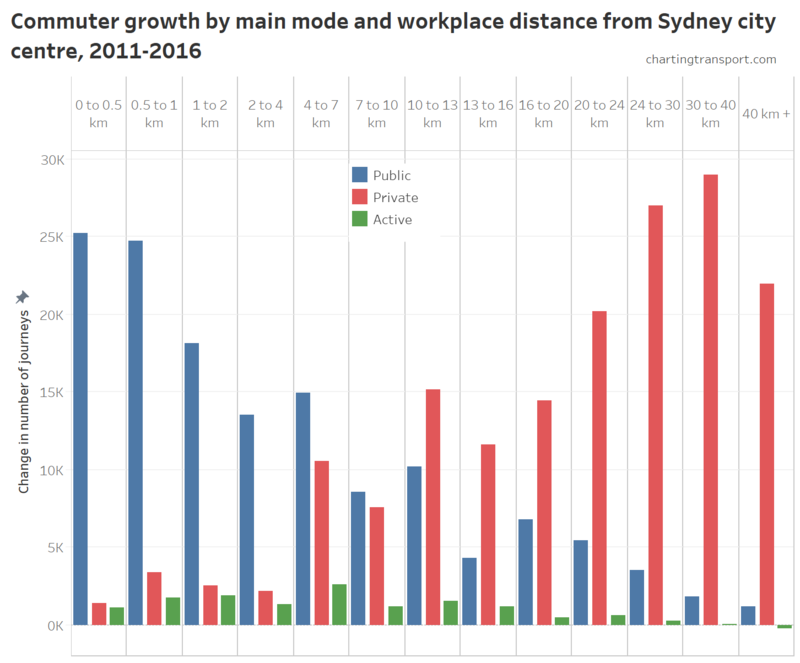 The median distance from the city centre of commuter workplaces decreased from 13.3 km in 2006 to 12.8 km in 2011 but then increased back to 13.3 km in 2016. Here’s another way at looking at the task. I’ve split Melbourne by SA2 distance from the CBD (to create 10km wide rings) for home and work locations (and further split out the CBD as a place of work) to create a matrix. Within each cell of the matrix is a pie chart – the size of which represents the relative number of commuter trips between that home and work ring, and the colours showing the main mode. I’ve then animated it over 2011 and 2016 (to make it five dimensional!). 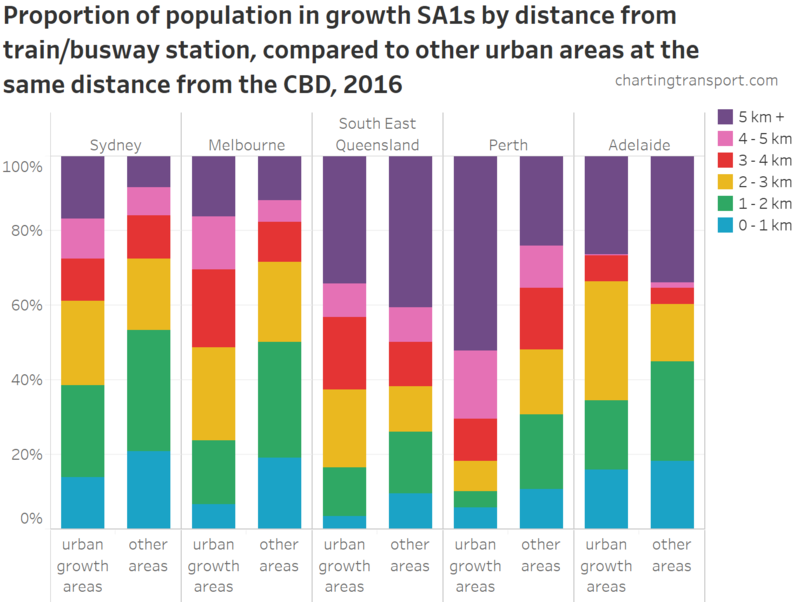 Public transport dominates journeys to the CBD, no matter how far away people’s homes are, but the number of such journeys falls away rapidly with home distance from the CBD. 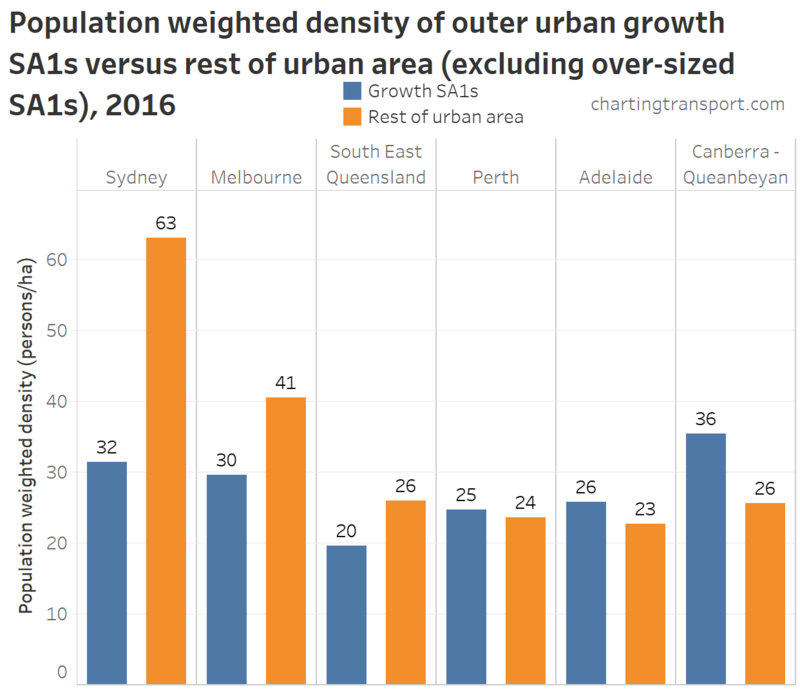 Very few people commute from the outer suburbs to the CBD. Private transport commuters are mostly travelling between middle suburbs, not to the CBD or even the to within 5 km of the city. However on average they are travelling towards the centre. This will become clearer shortly. 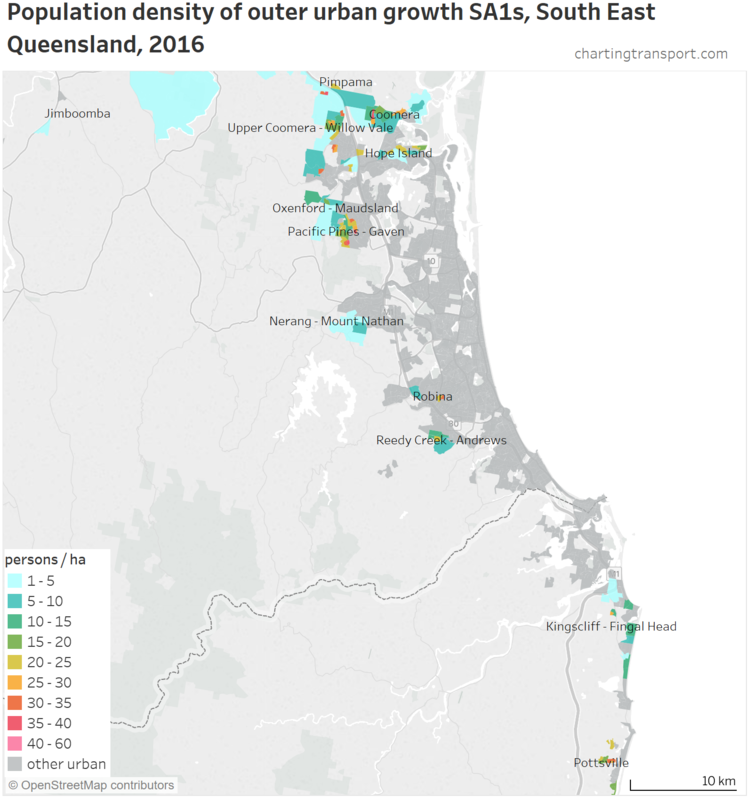 Public transport otherwise only gets 15% or better mode share for trips to within 5 km of the centre or the relatively small number of outward trips from the inner 5km. A significant growth in private transport trips, particularly within 5 – 25 km from the CBD. A significant growth in public transport trips, mostly to the CBD and areas within 5 km from the CBD. Where are commuters headed on different modes? This next analysis looks at the distribution of origins and destinations for people using particular modes, which can be compared to all journeys. 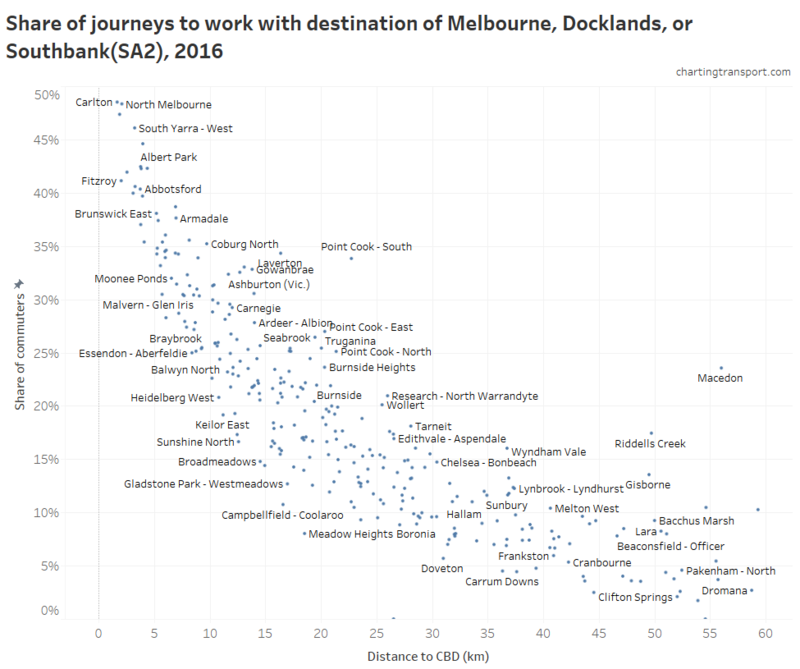 The next chart looks at the distributions of work destinations by main mode for each census year (using a higher resolution set of distances from the CBD). 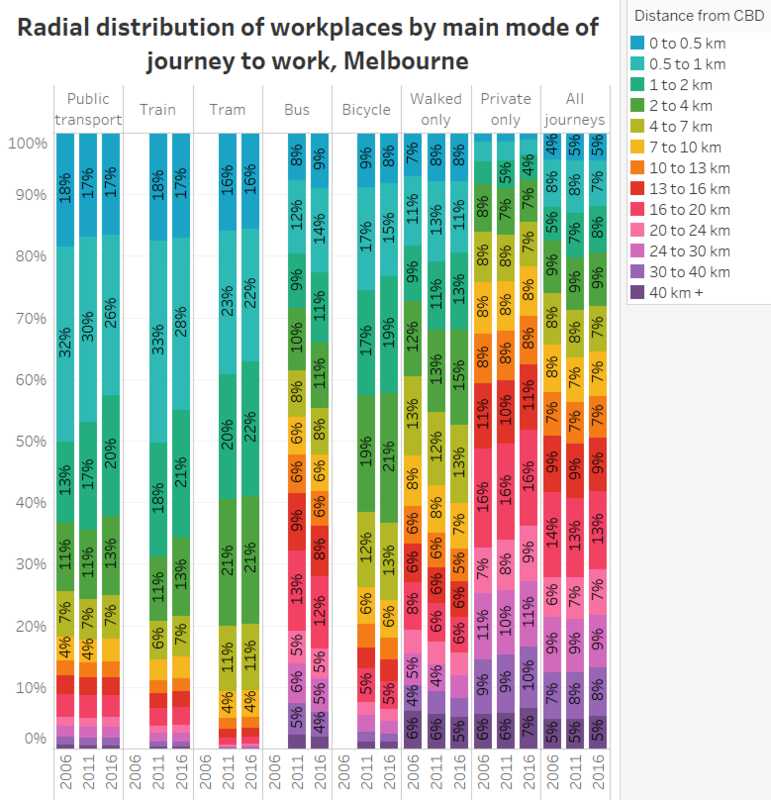 On the far right is the distribution of jobs across Melbourne (with roughly equal numbers in each distance interval), and then to the left you can see the distribution of workplace locations for people who used particular modes. You can see how different modes are more prominent in different parts of the city. You might need to click to enlarge to read the detail. In 2016, trips to within 2km of the city centre accounted for 19% of all journeys, but 62% of public transport journeys, 31% of walking journeys, and only 7% of private transport only journeys. Train, tram, and bicycle journeys are biased towards the inner city, while private transport only journeys are biased to the outer suburbs. Walking and bus journeys are only slightly biased towards the inner city. 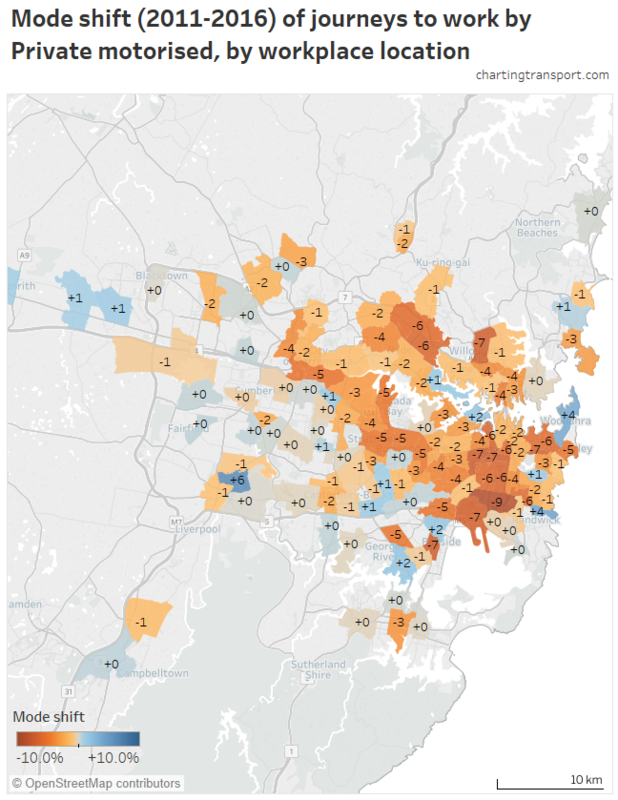 This should come as no surprise given the maps above showing high public transport mode shares in the inner city and very high private transport mode shares in most of the rest of the city. 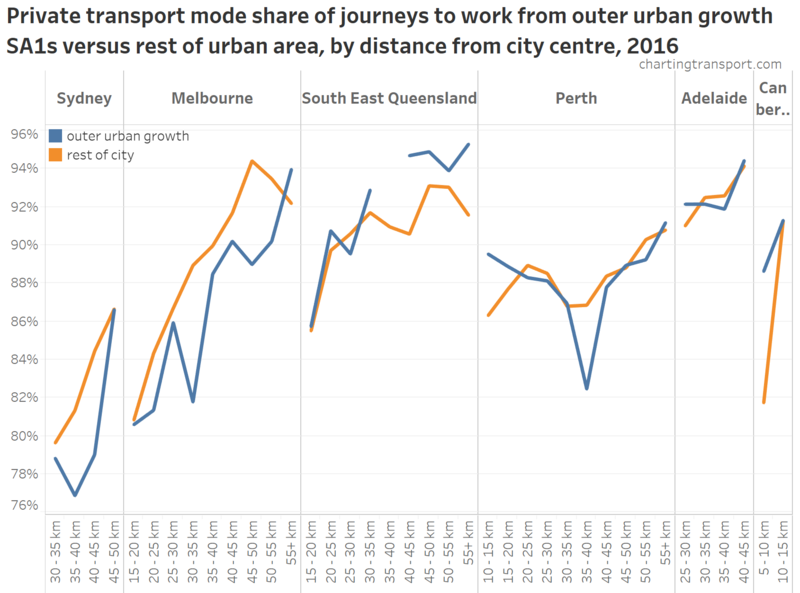 Over time, public transport journeys to work became less likely to be to the central city as public transport gained more trips to the suburbs. However bus journeys to work became more likely to be in the city centre (this probably reflects the significant upgrades in bus services between the Doncaster area and city centre). Unless a mode is labelled “only”, then I’ve counted journeys that involved that mode (and possibly other modes). Sorry I don’t have public transport mode specific data for 2006 so there are some blank columns. Where do commuters using different modes live? Private transport commuters were slightly more likely to come from the middle and outer suburbs. Tram and bicycle commuters were much more likely to come from the inner city. Bus commuters were over-represented in the 15-25 km band – probably dominated by the Doncaster area. 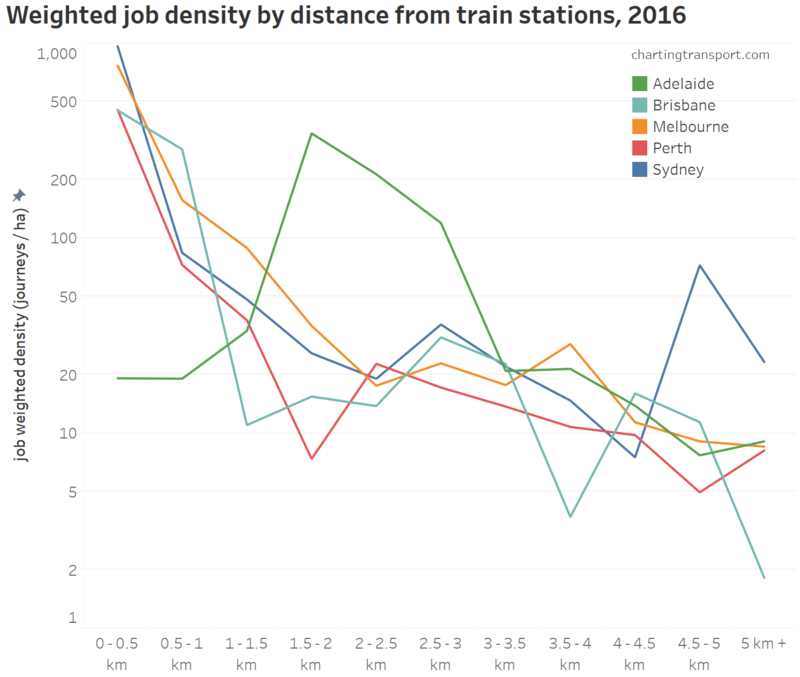 Train commuters were over-represented in distances 5-25 km from the city, and under-represented in distances 35 km and beyond. Journeys by both public and private transport were more likely to come from the middle suburbs. 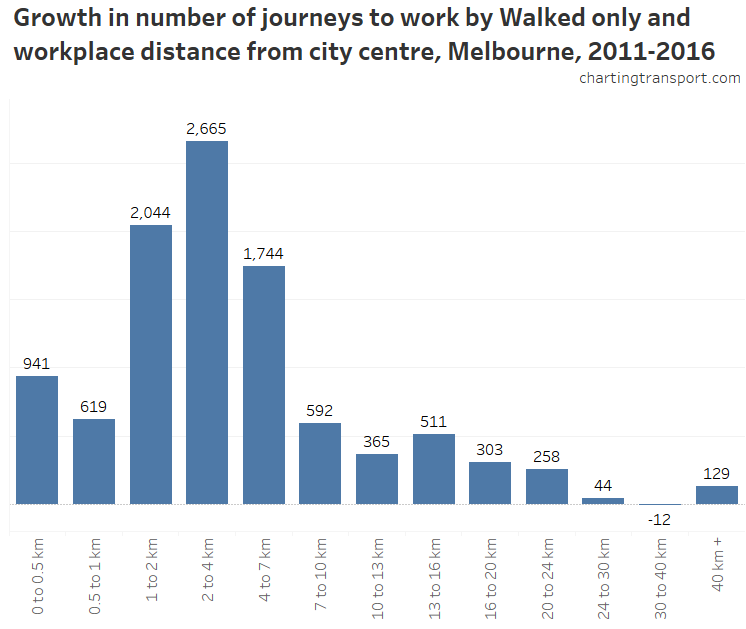 51% of people walking to work live within 5 km of the city centre, and the growth in walking journeys to work has been much stronger in the inner city. You can see the most common combination is from 5-15 kms to 0-5 kms. This is followed by 15-25 to 0-5 kms and 0-5 to 0-5 kms. There is a much more even distribution. This is much more polarised, with almost 40% of active transport trips being entirely within 5 km of the city centre. The second most common journey is within 5-15km of the city followed by from 5-15 km to 0-5 km. In future posts I will look at more specific mode shares and shifts in more detail, the relationship between motor vehicle ownership and journey to work mode shares, and much more! I hope you have found this analysis at least half as interesting as I have. This post was updated on 24 March 2018 with improved maps. Also, data reported at SA2 level is now as extracted at SA2 level for 2011 and 2016, rather than an aggregation of CD/SA1/DZ data (each of which has small random adjustment for privacy reasons, which amplifies when you aggregate, also some work destinations seem to be coded to an SA2 but not a specific DZ). This does have a small impact, particularly for mode shifts and mode shares of new trips. On 7 April 2018 this post was updated to count journeys by “Other” and “Bicycle, Other” as private transport to ensure completeness of total mode share (we don’t actually know what modes “Other” is, so this isn’t perfect).